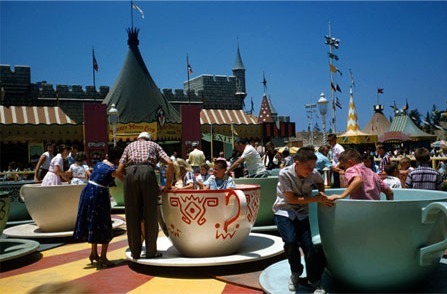 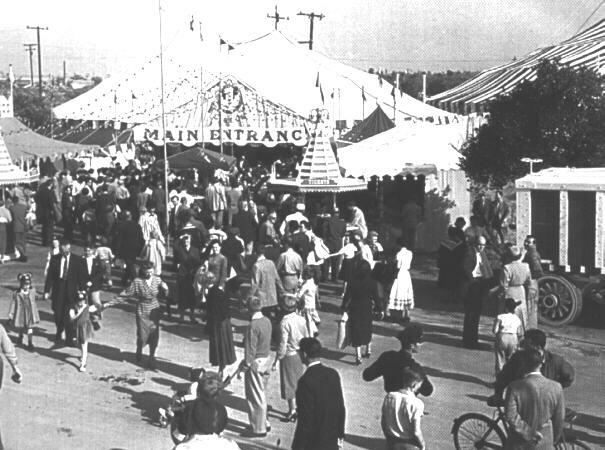 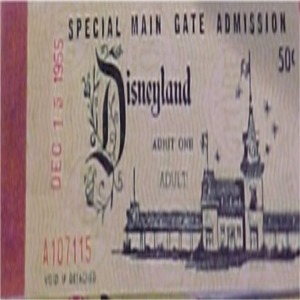 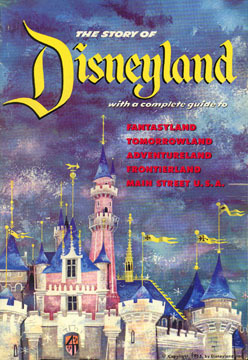 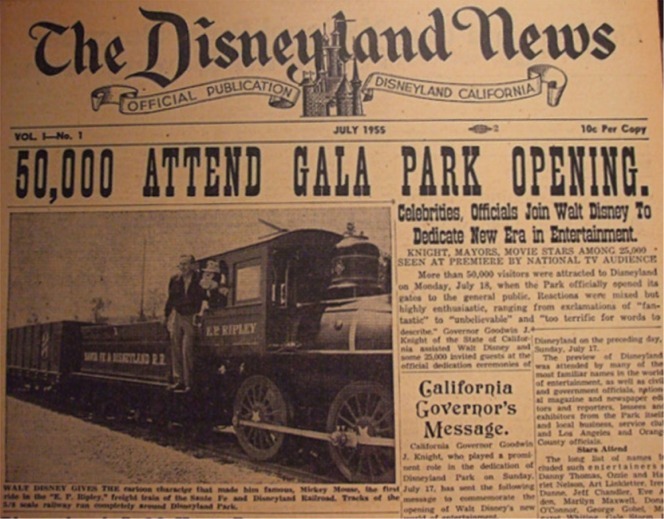 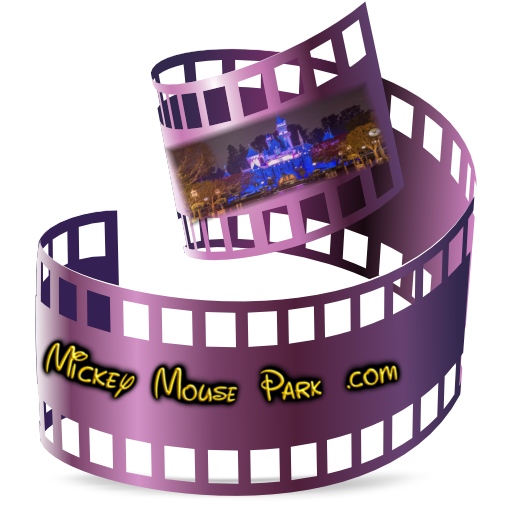 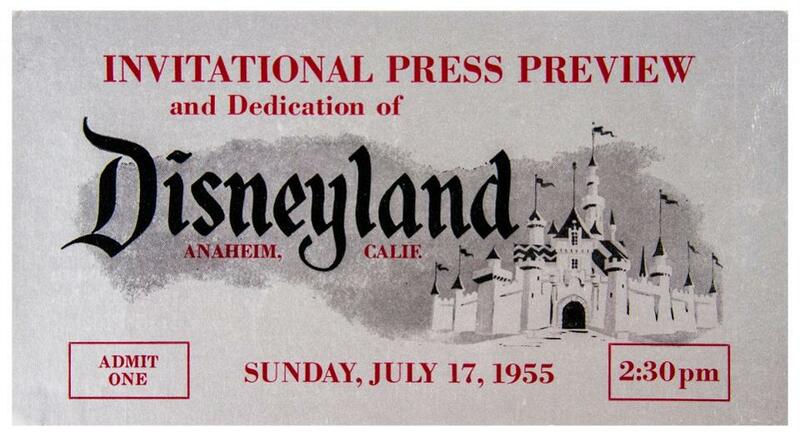 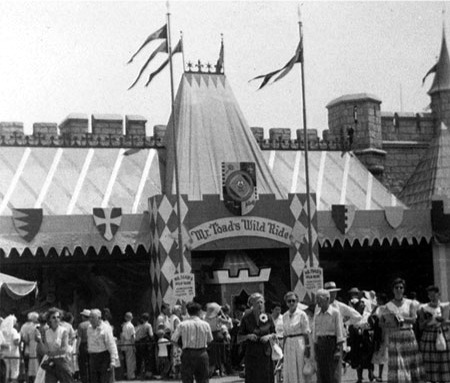 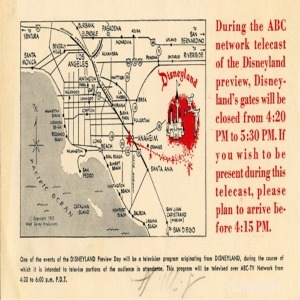 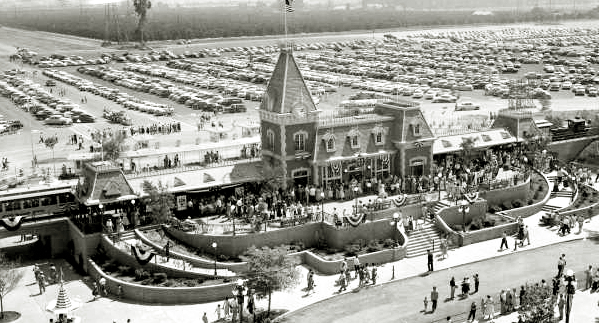 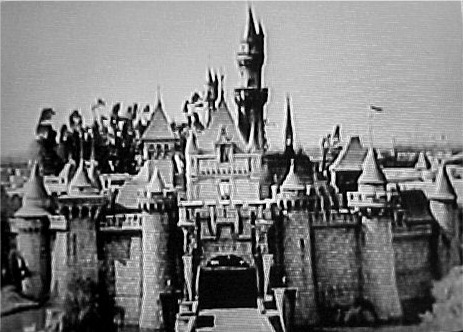 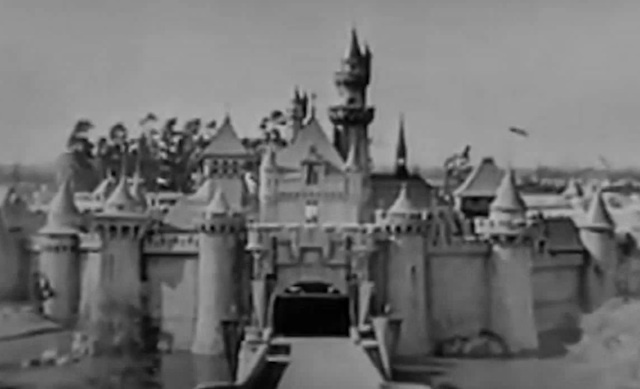 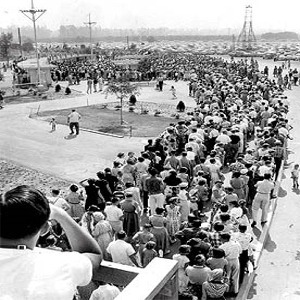 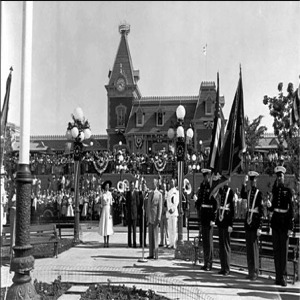 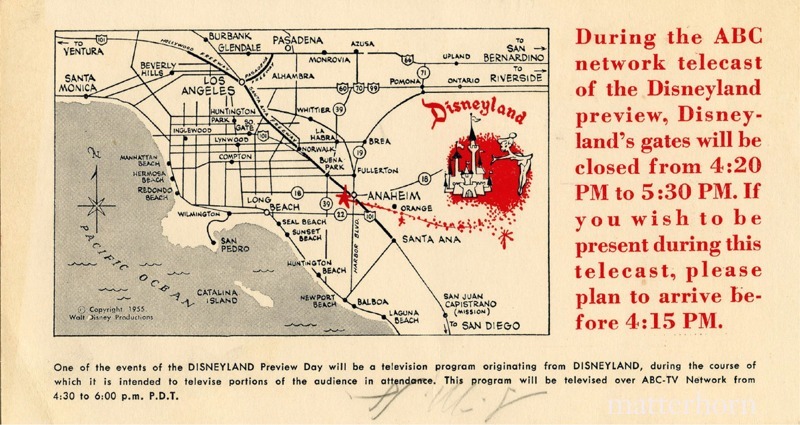 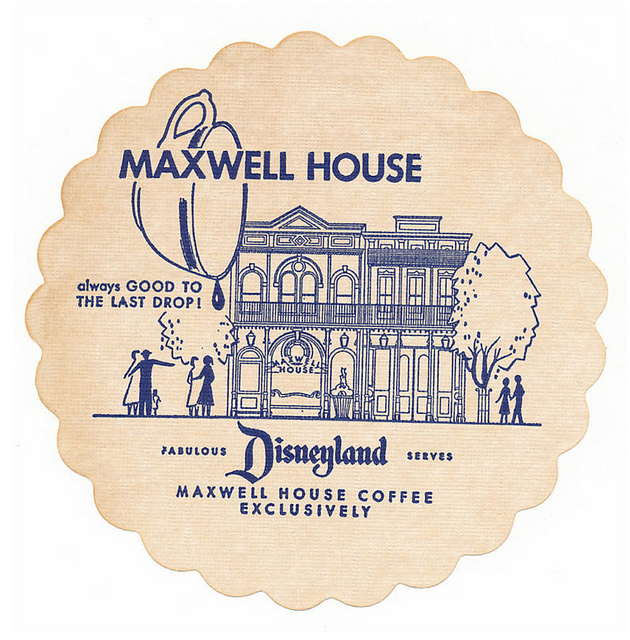 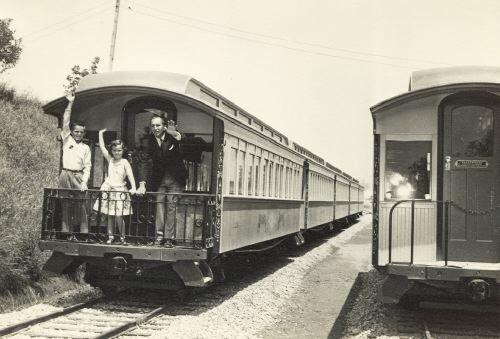 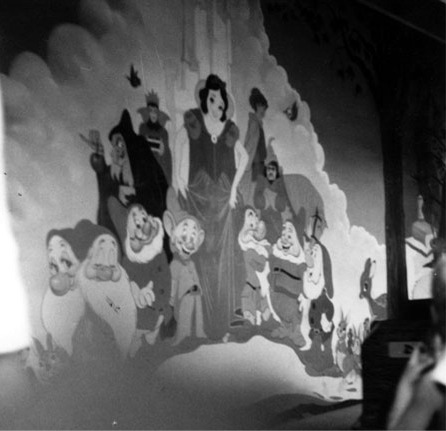 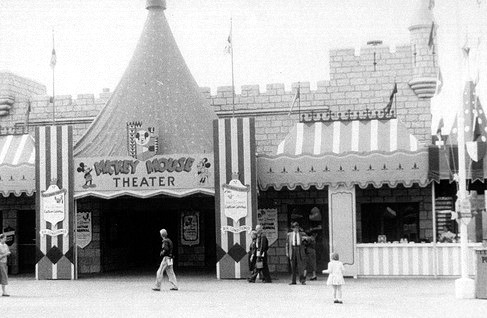 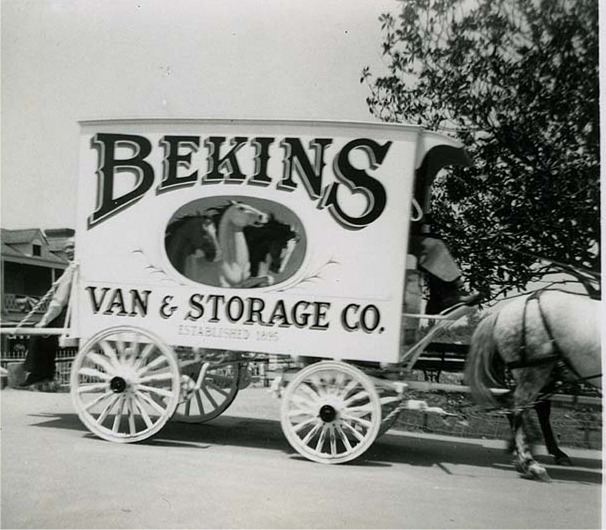 July 18-- - Disneyland opens to the General public. 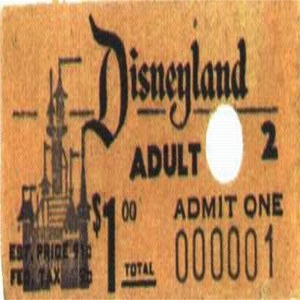 Official general admission costing $1. 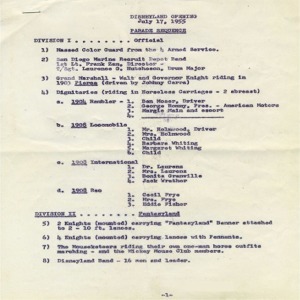 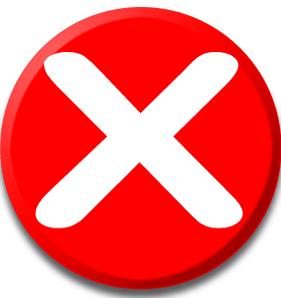 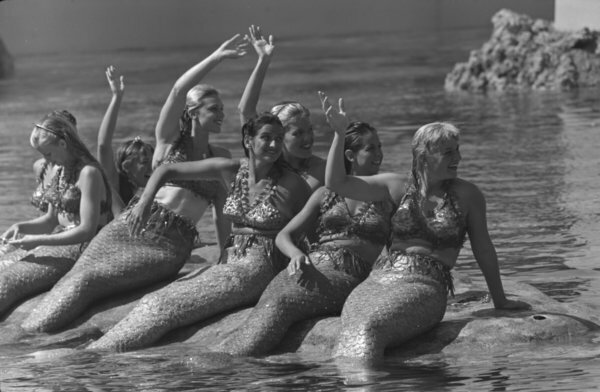 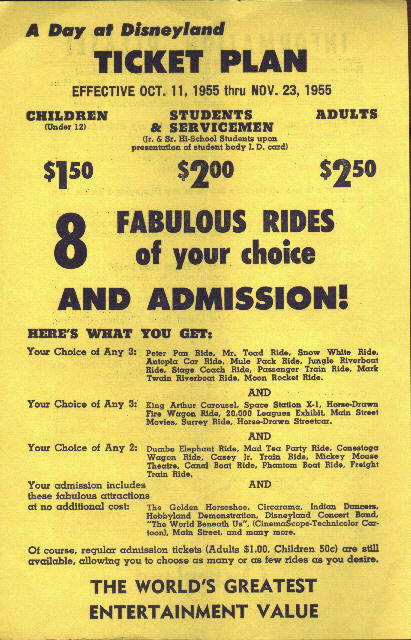 Cost of attractions ranged from 10c to 35c. 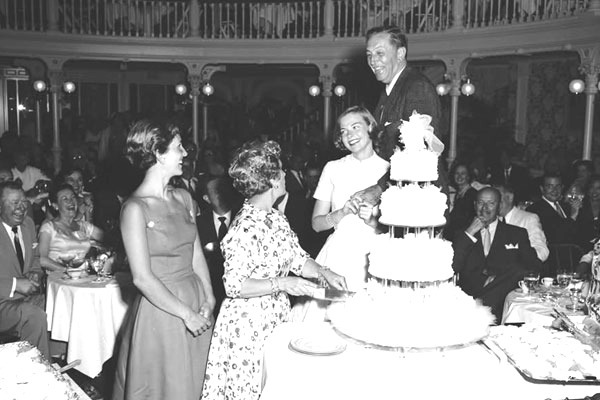 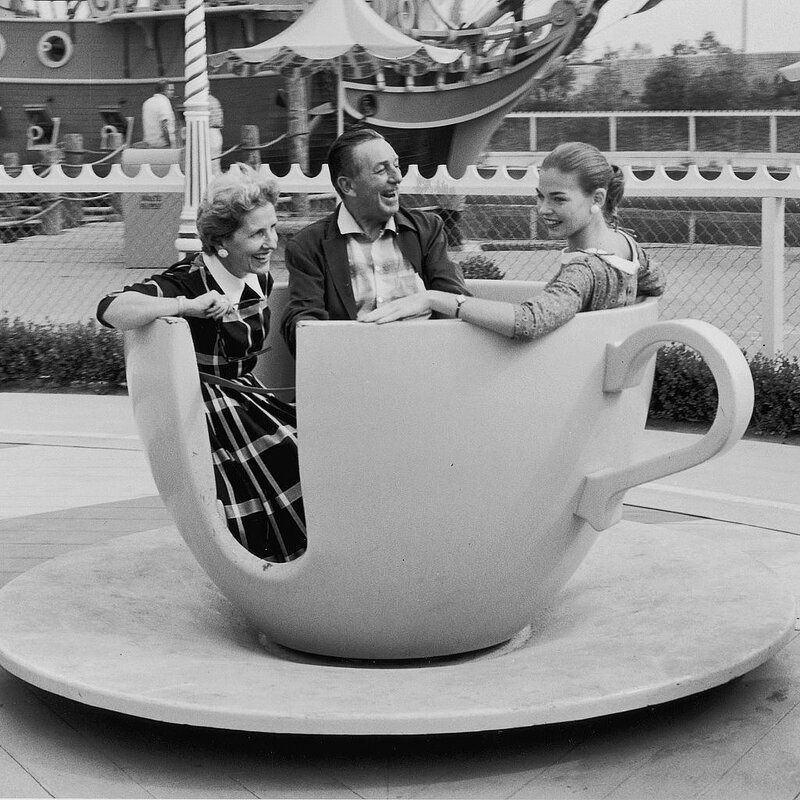 July--Walt and Lillian's 30th Anniversary celebrated at Disneyland. 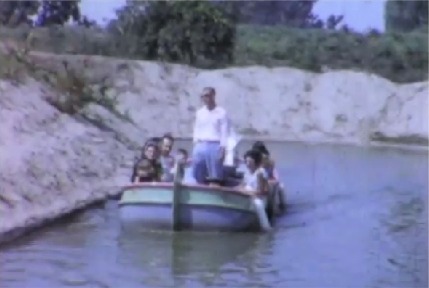 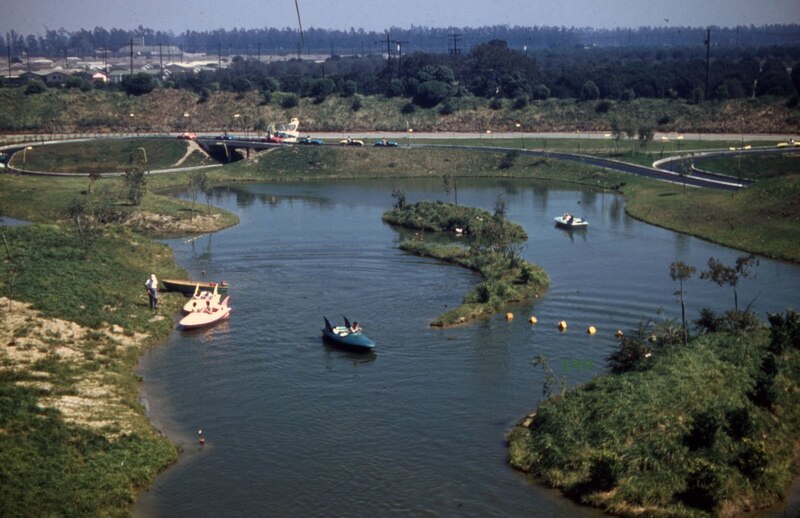 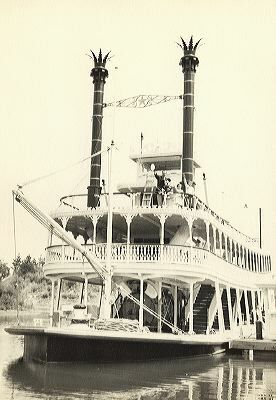 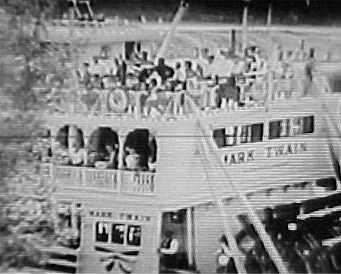 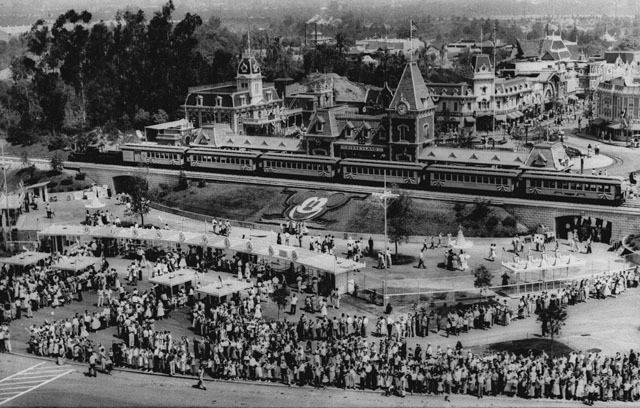 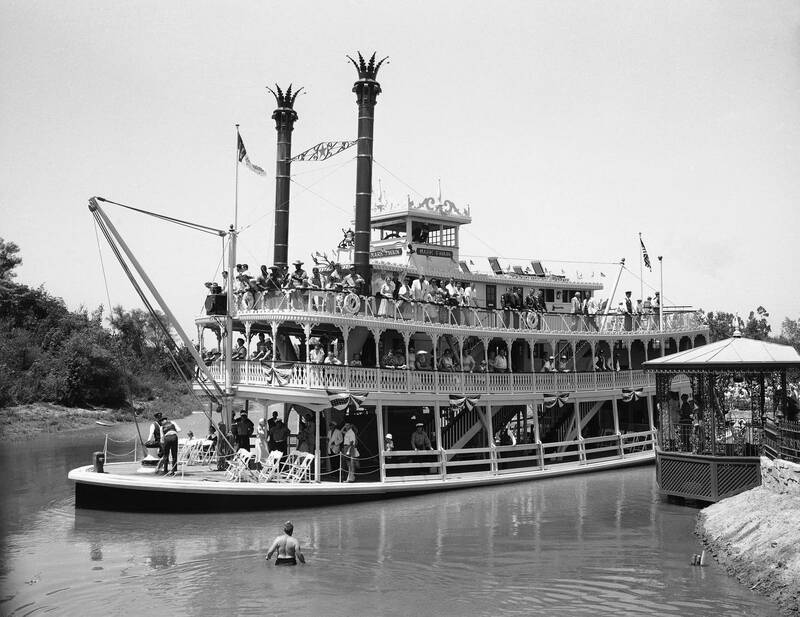 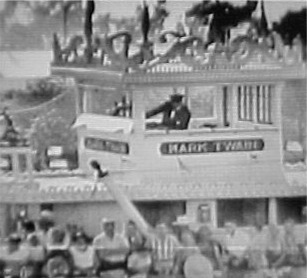 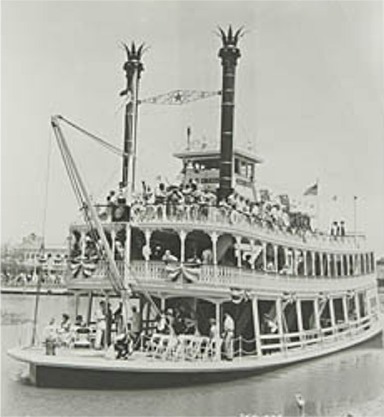 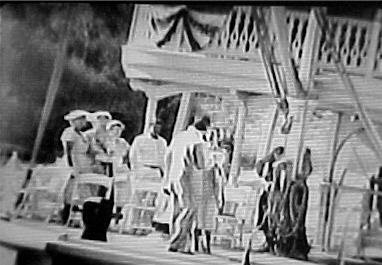 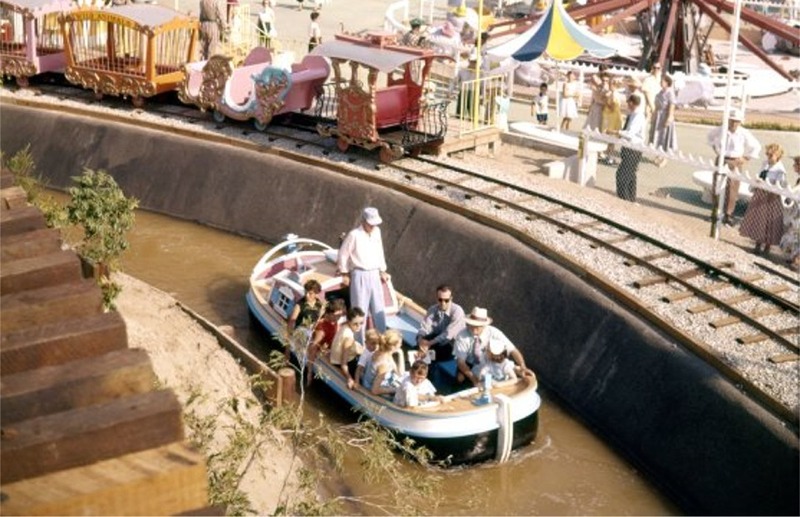 Mark Twain makes its first circle of the Rivers of America. 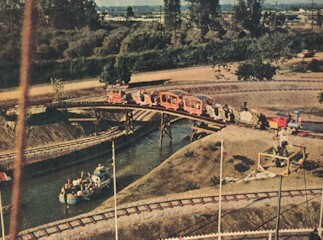 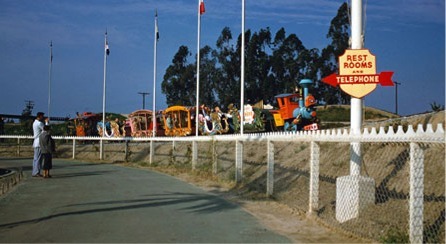 The two Disneyland steam trains (C.K. 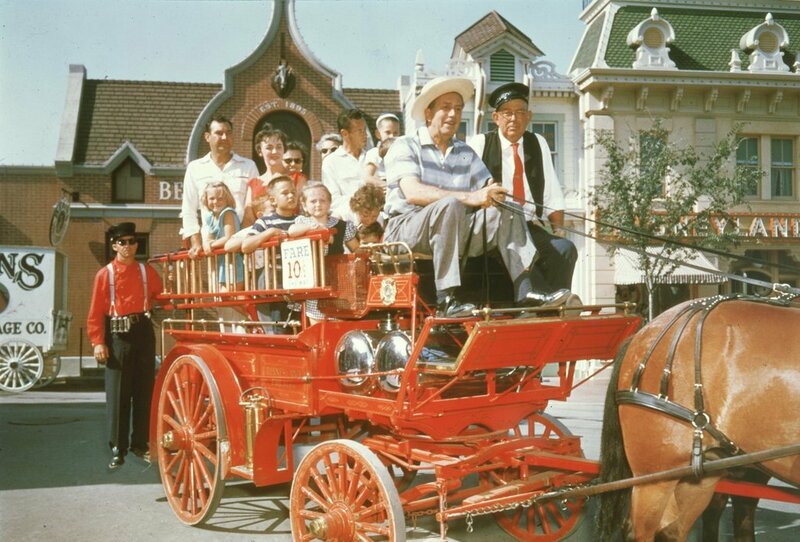 Holliday and E.P. 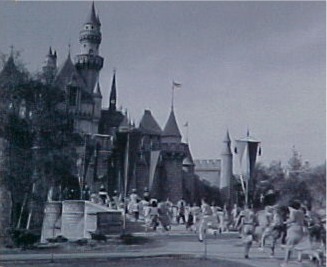 Ripley) make their first run around the Park. 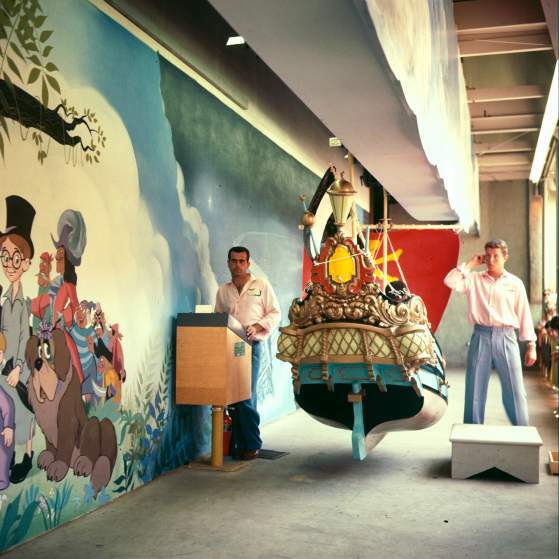 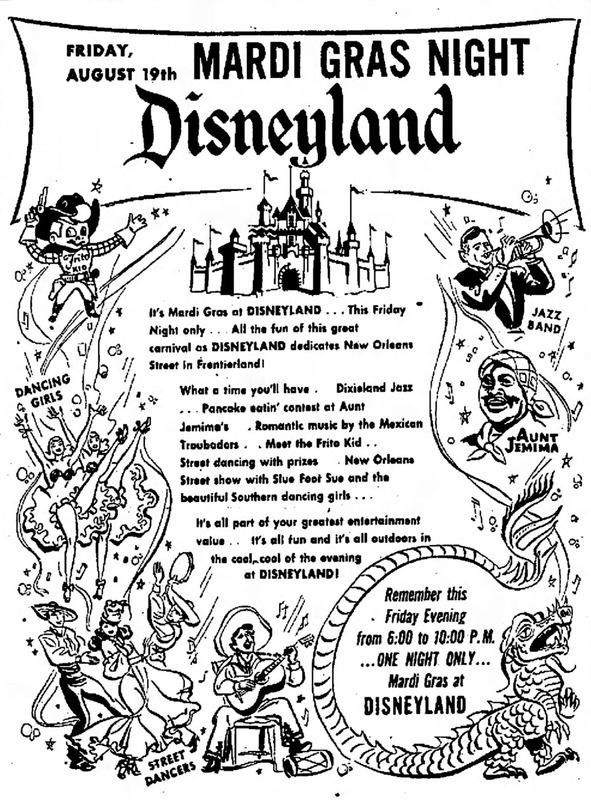 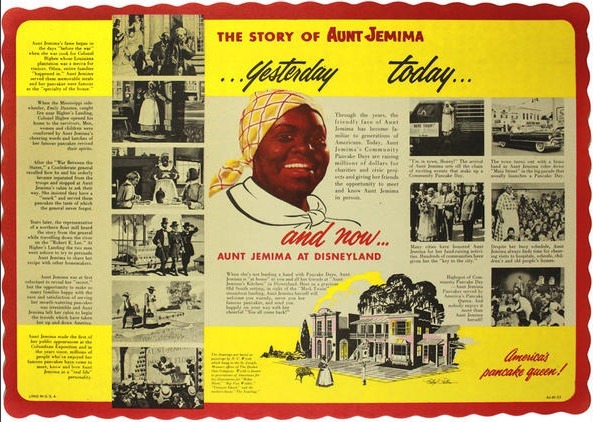 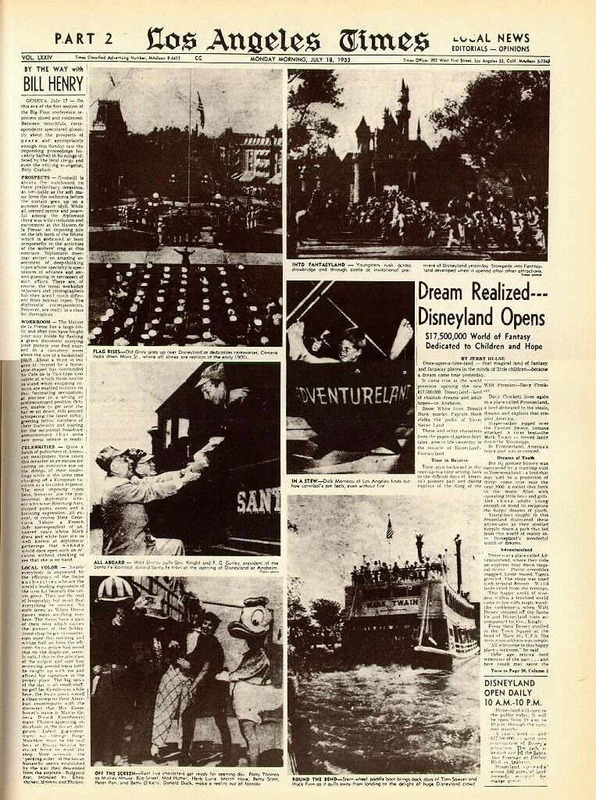 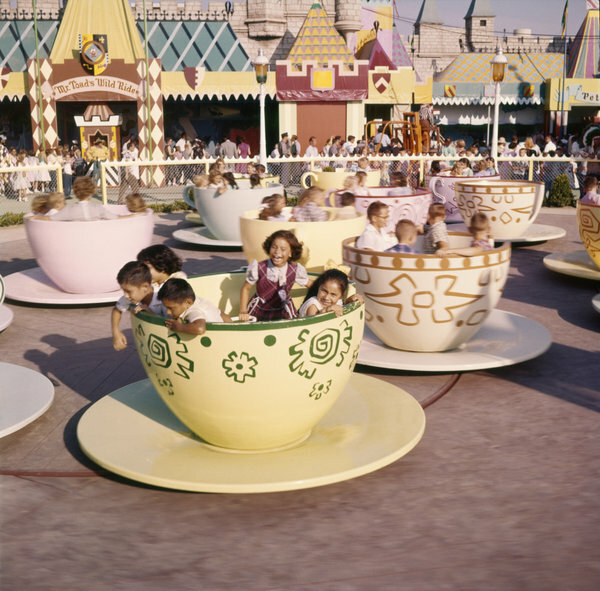 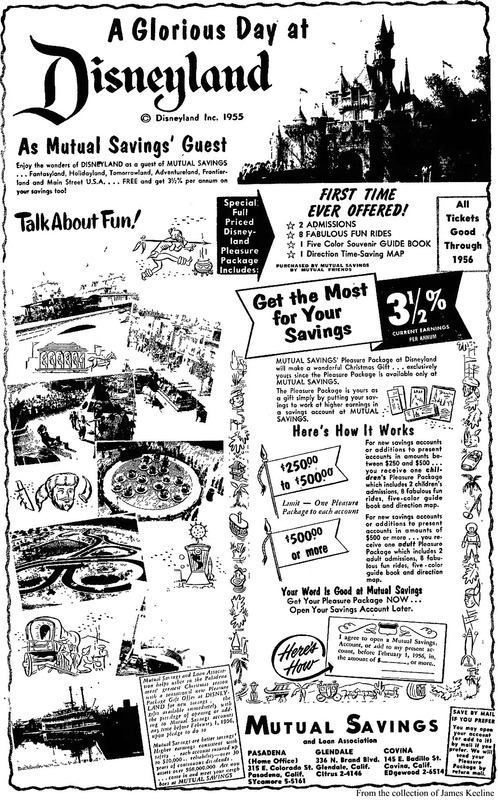 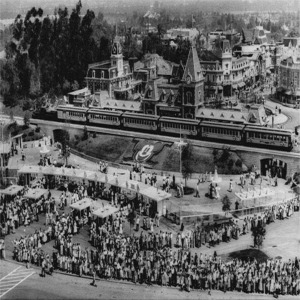 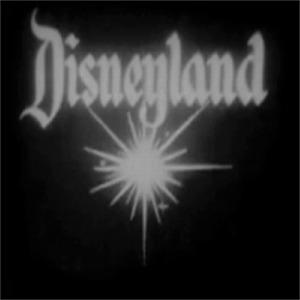 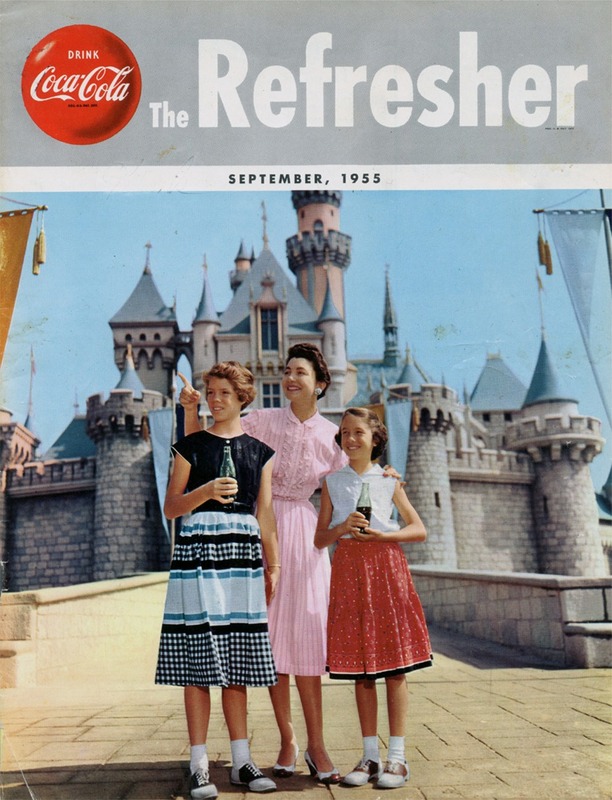 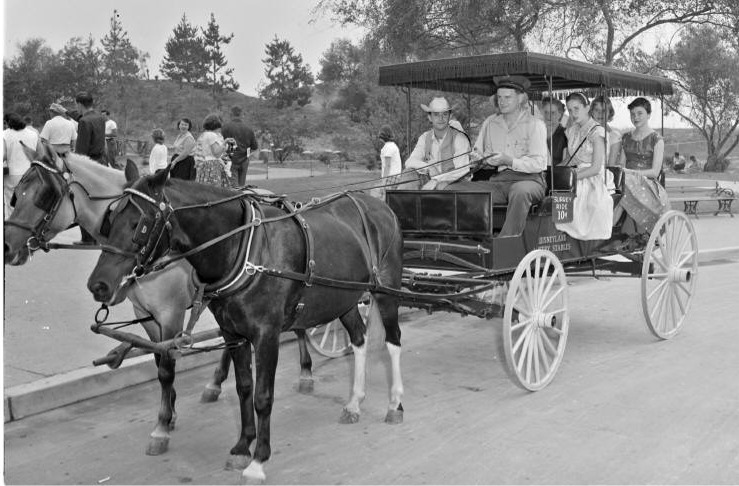 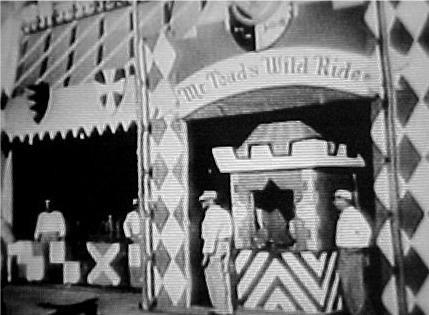 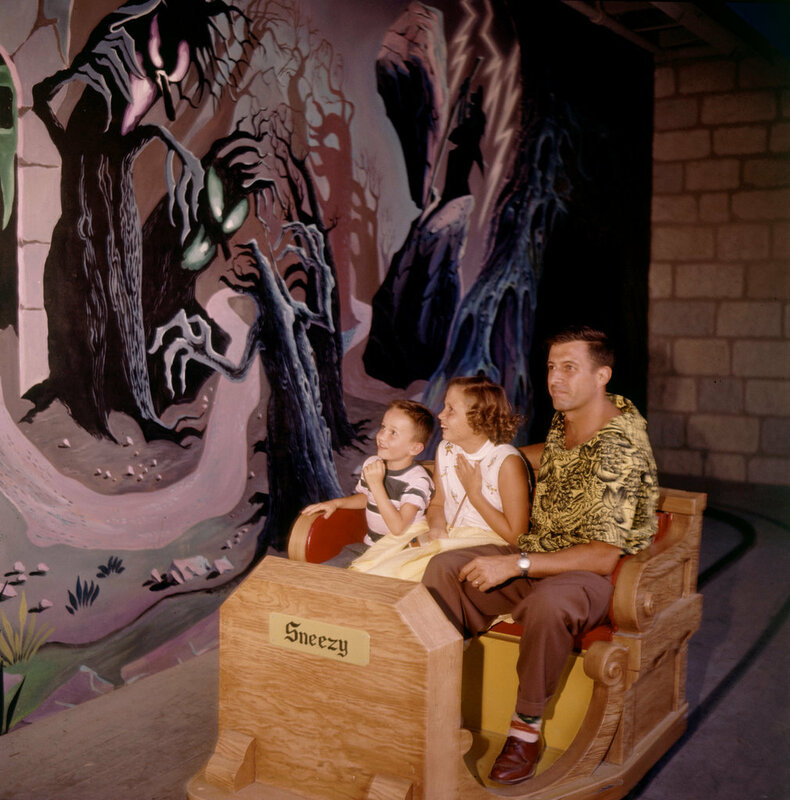 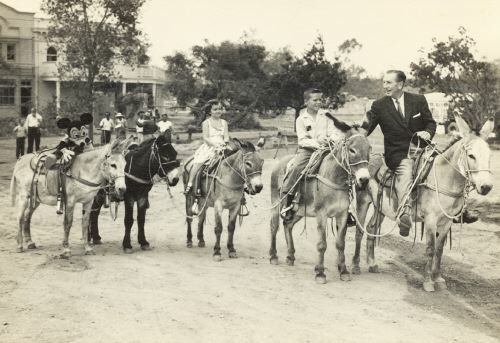 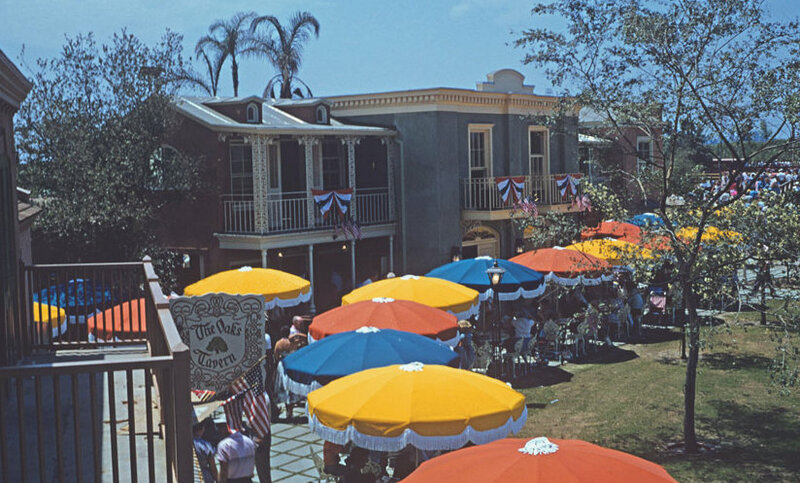 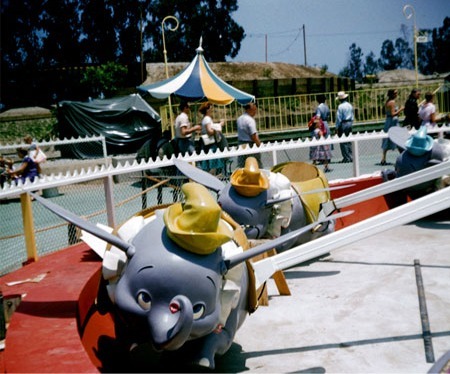 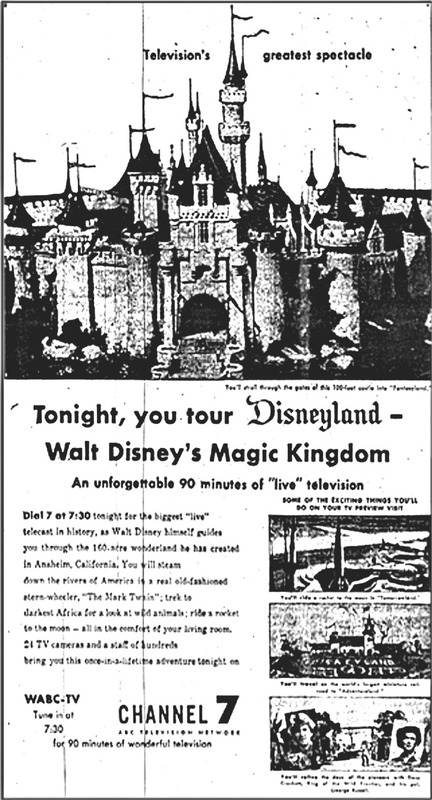 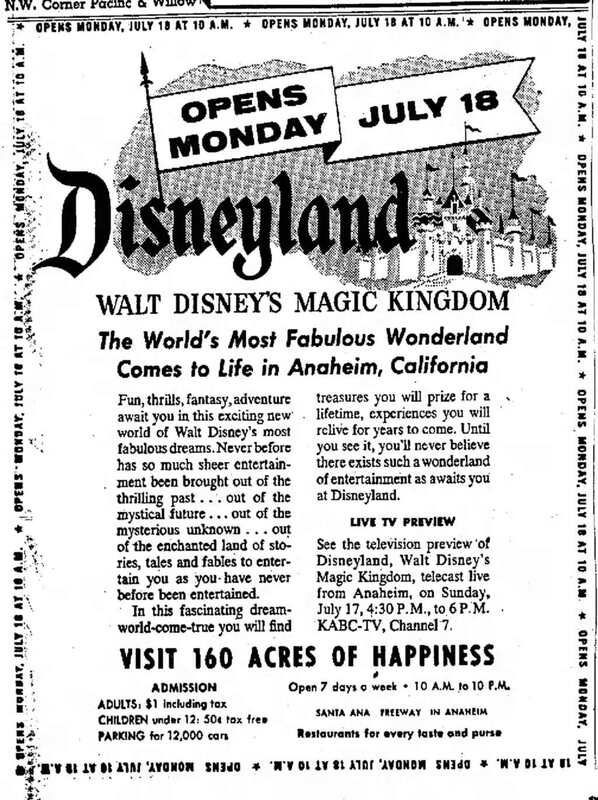 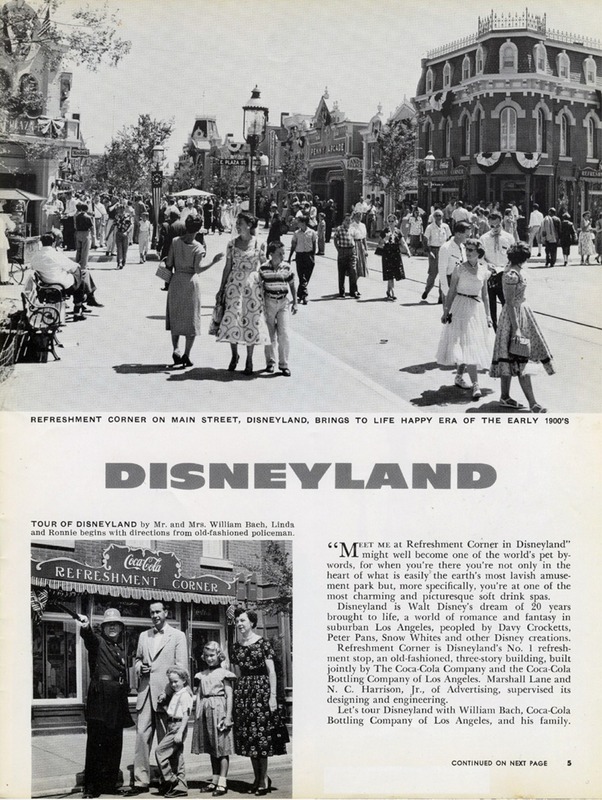 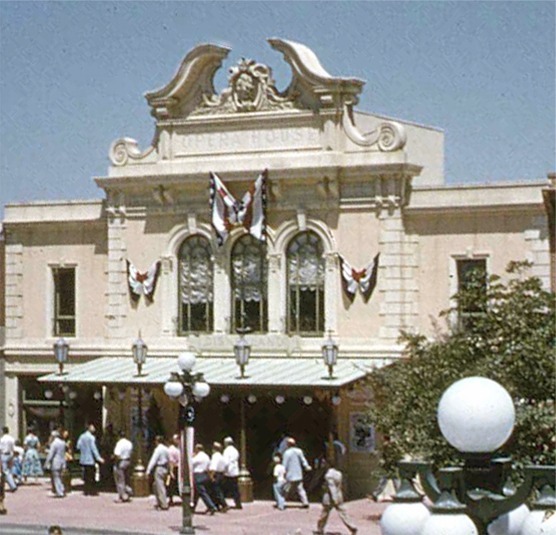 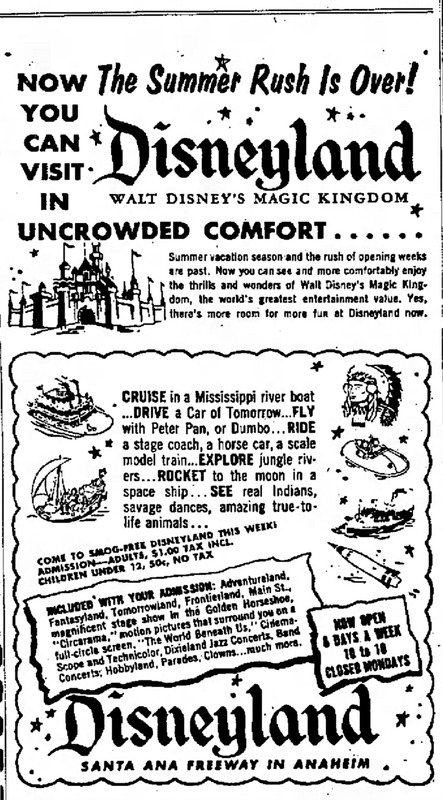 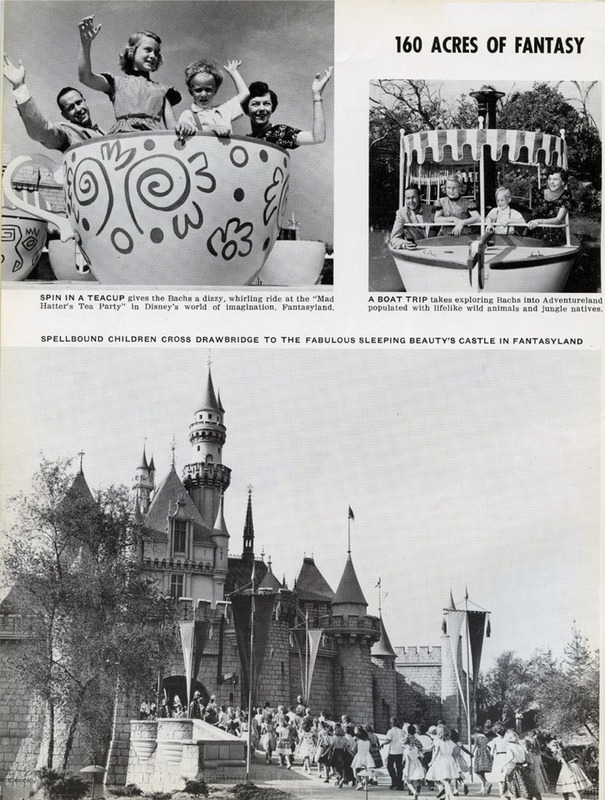 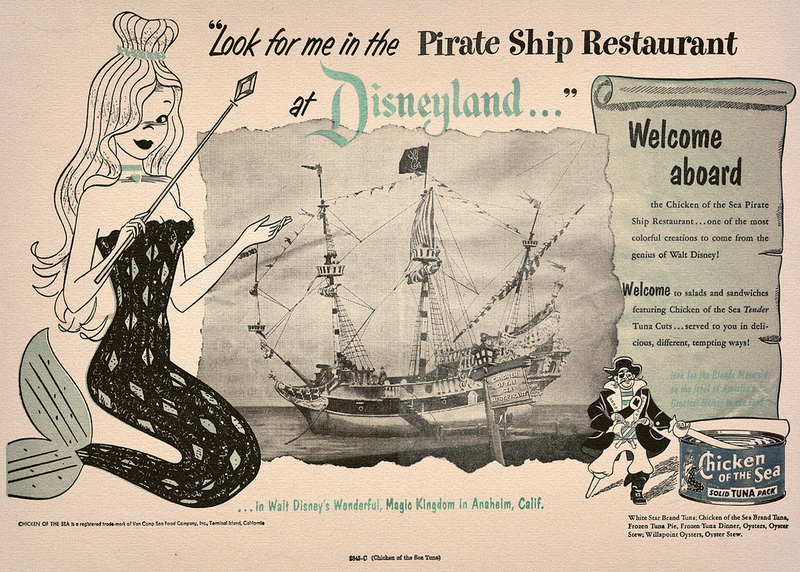 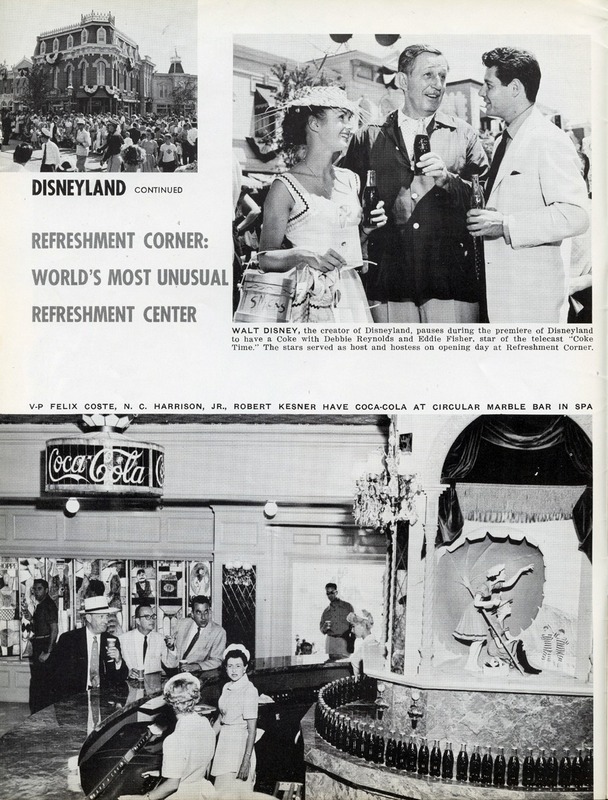 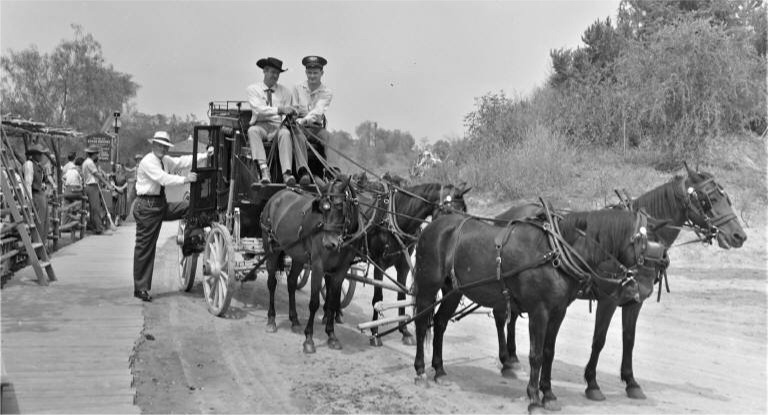 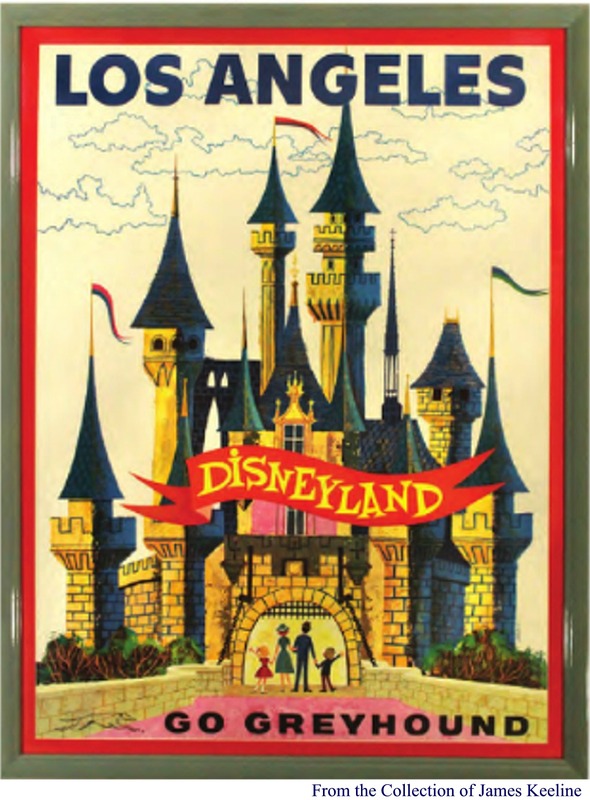 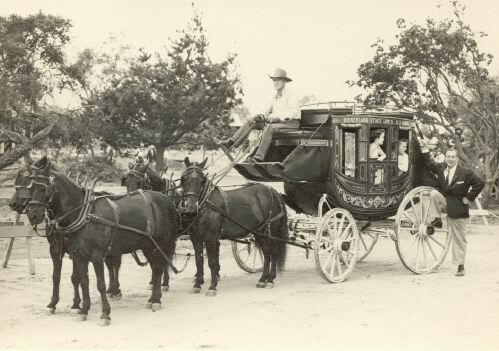 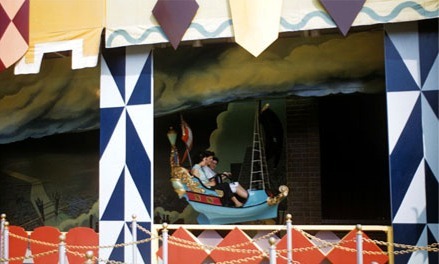 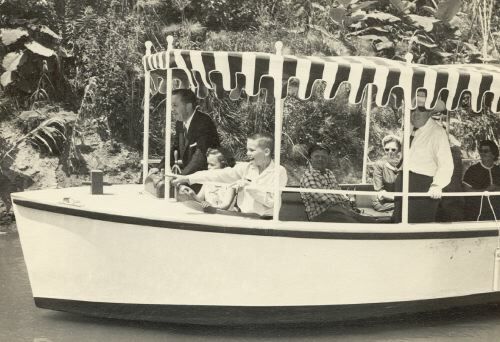 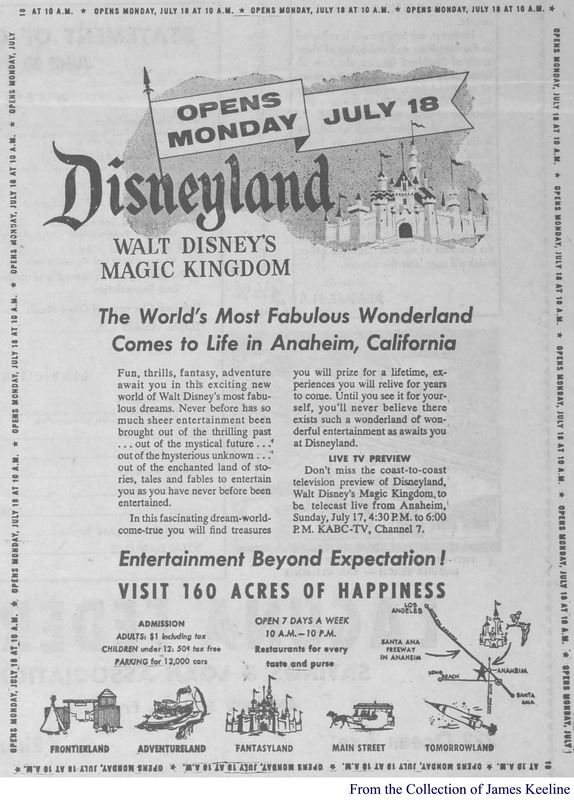 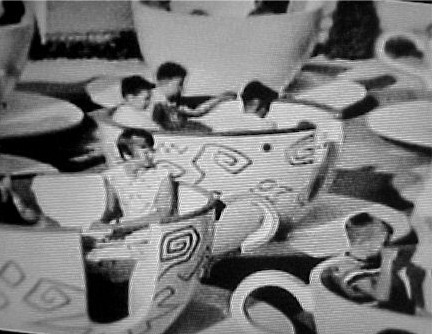 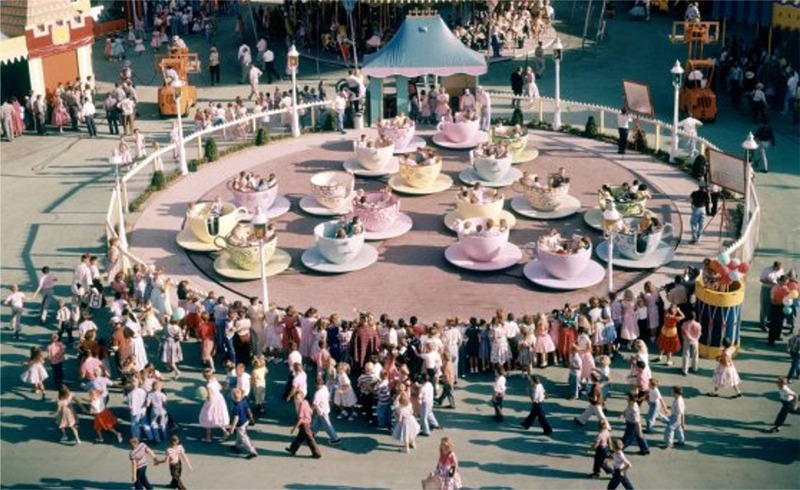 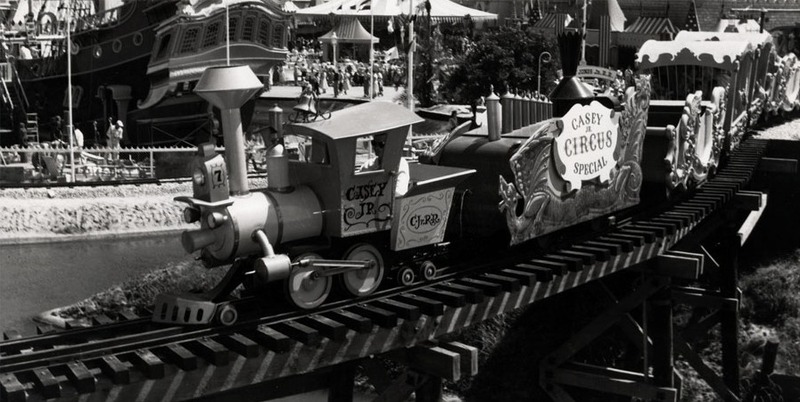 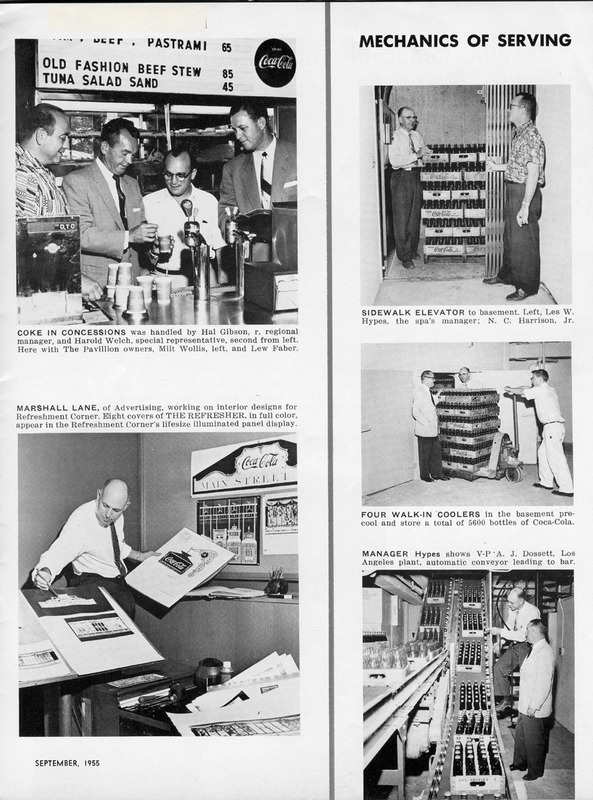 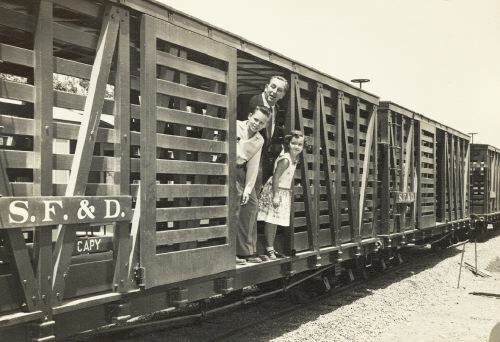 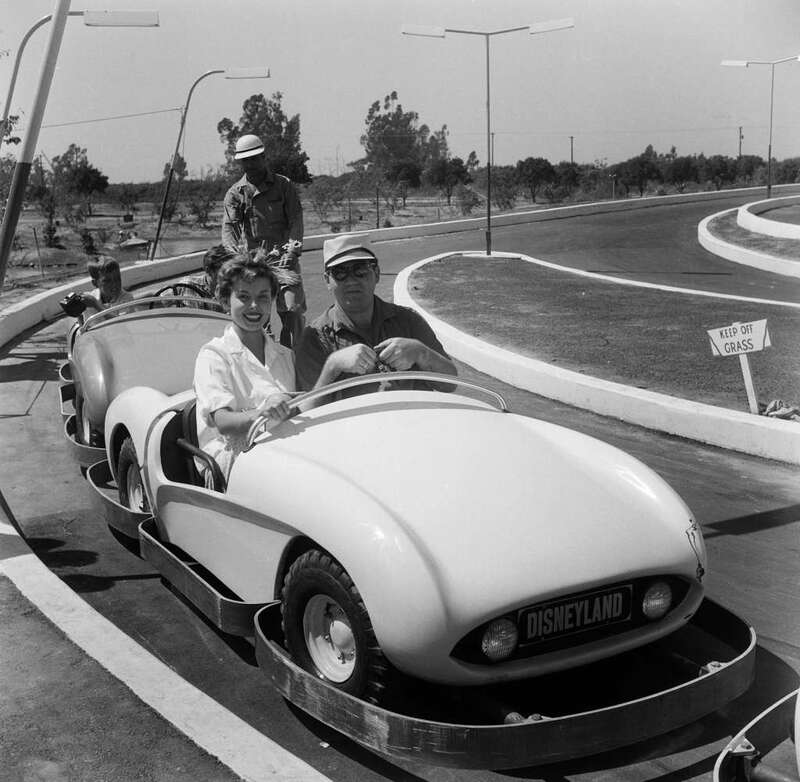 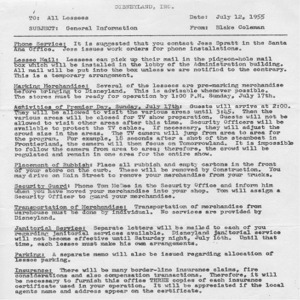 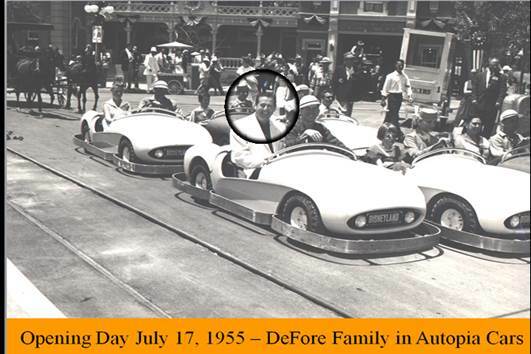 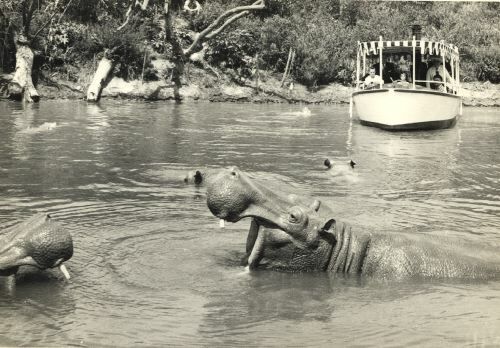 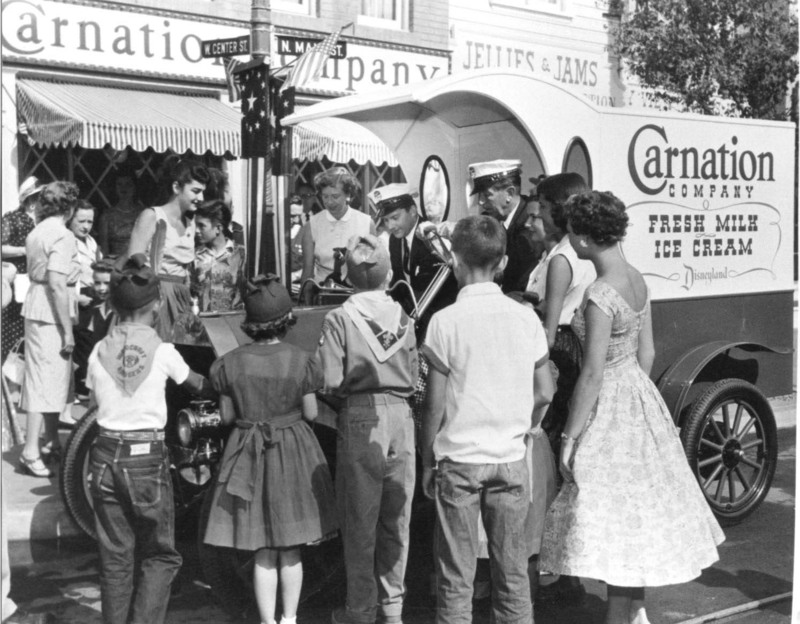 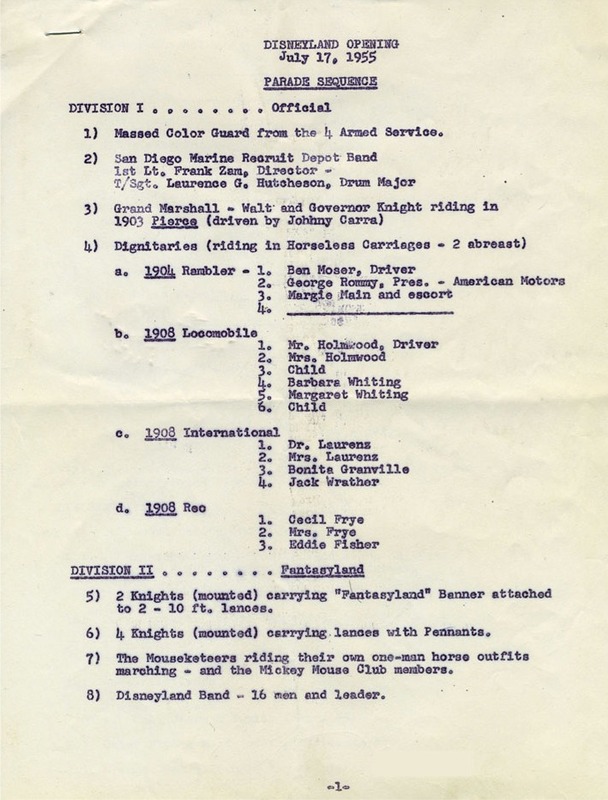 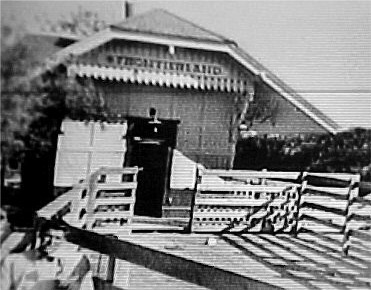 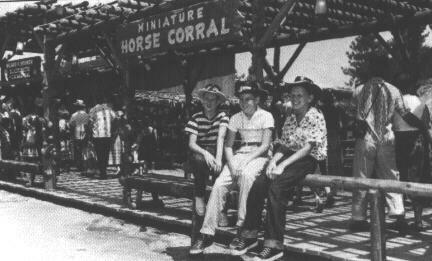 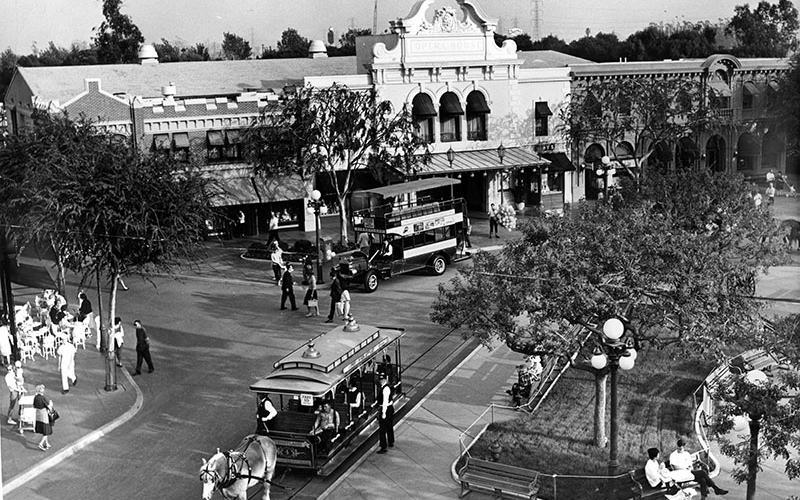 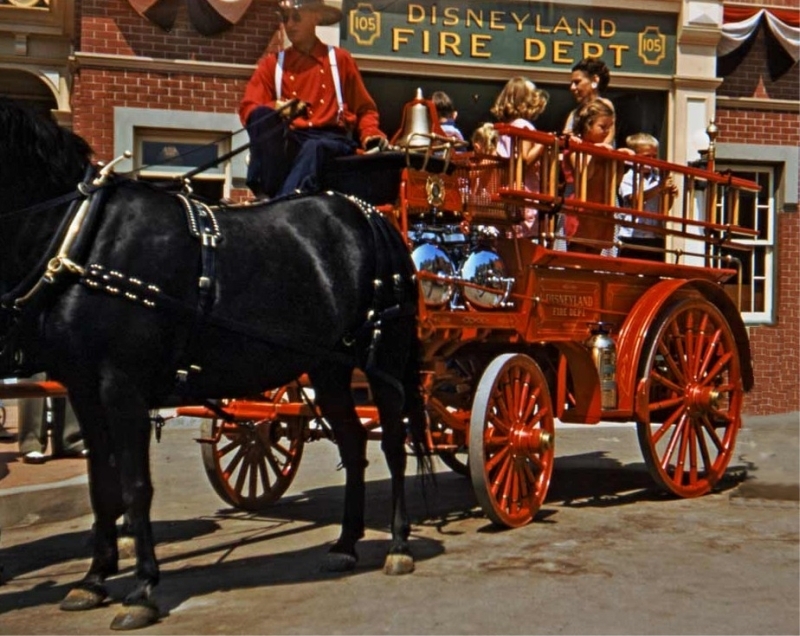 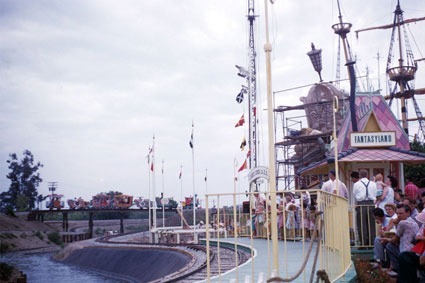 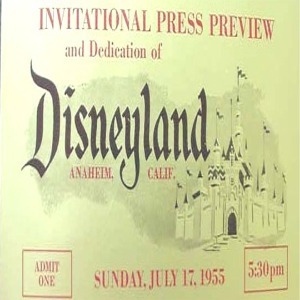 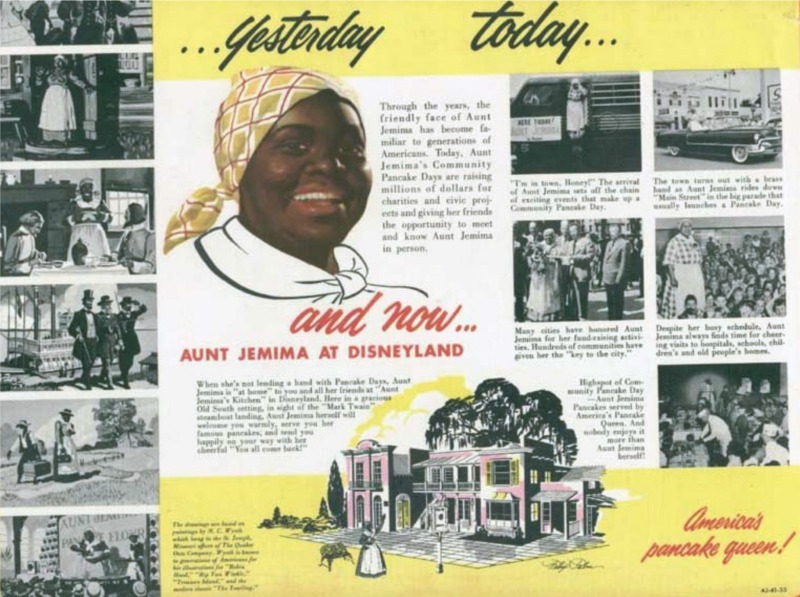 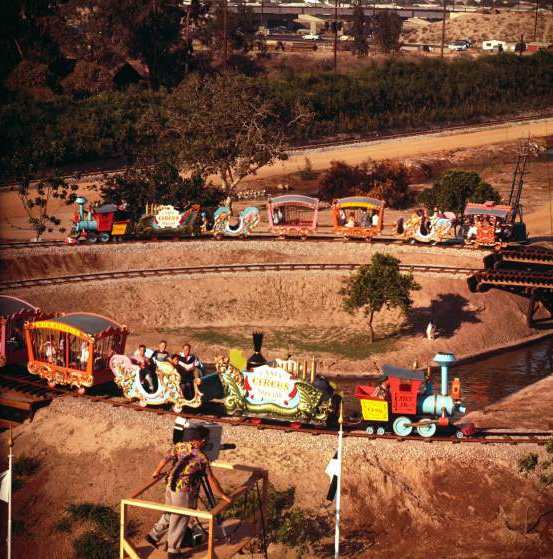 July 17 5:30 p.m.--Disneyland opens with 18 attractions, including the Jungle Cruise, Tomorrowland Autopia, Mr. Toad's Wild Ride and the Mark Twain. 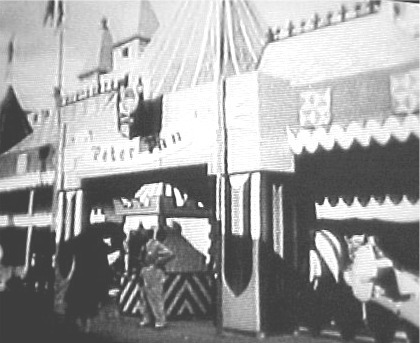 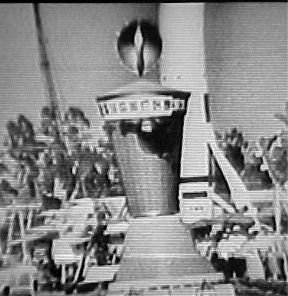 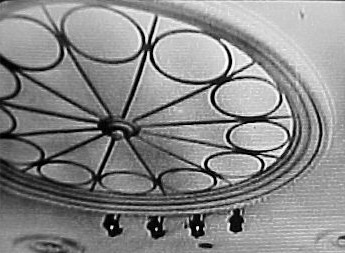 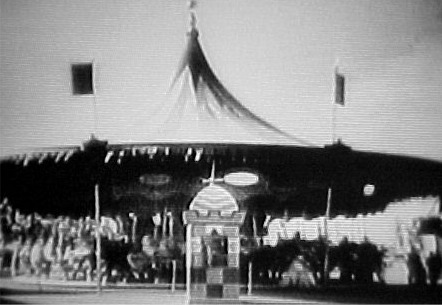 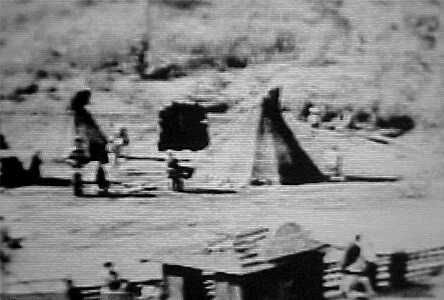 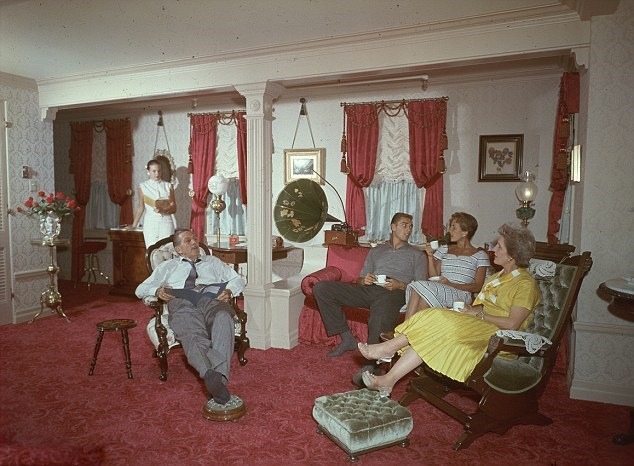 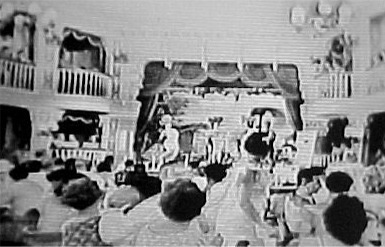 The televised opening is hosted by Ronald Reagan, Art Linkletter and Bob Cummings. 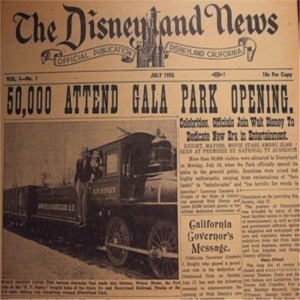 The 11,000 invitation only tickets to opening day are so easily duplicated that first day attendance shoots to 28,154. 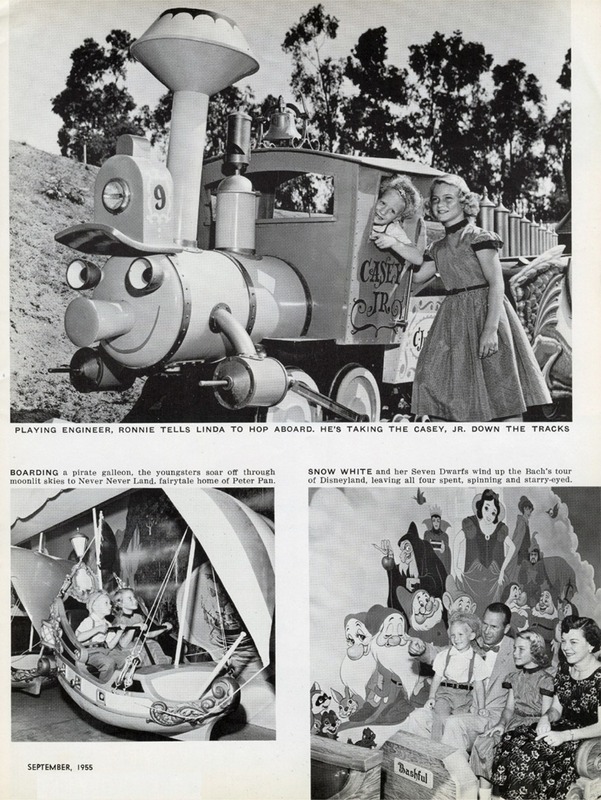 With a ABC television audience of 90 million. 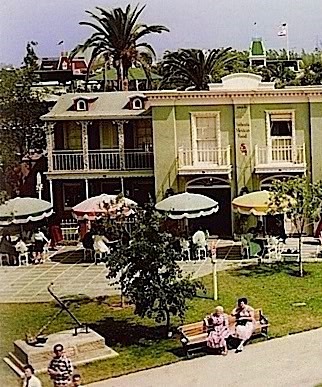 One entrepreneur folds a ladder over the park's backside fence and lets people in for $5. 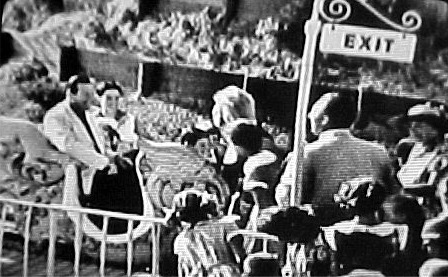 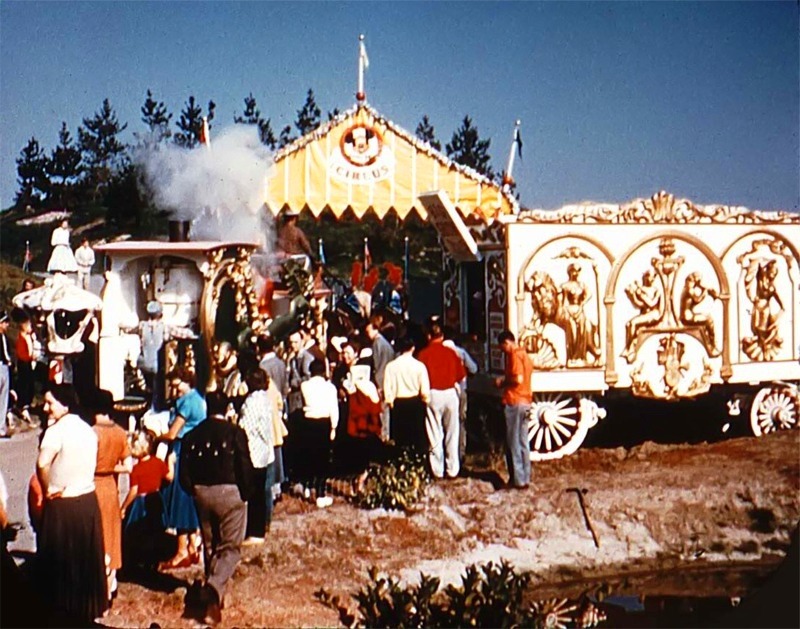 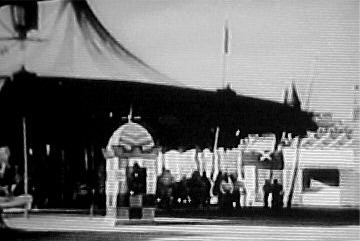 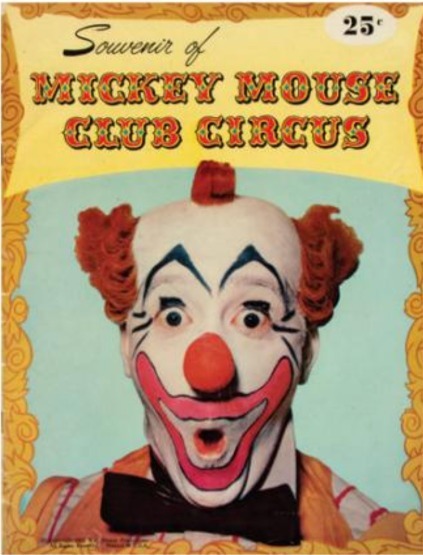 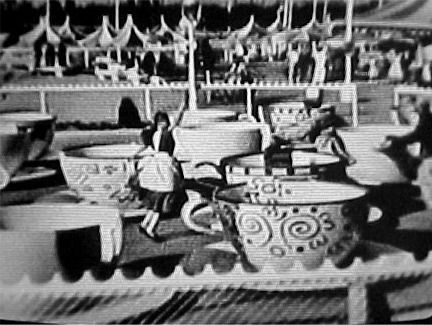 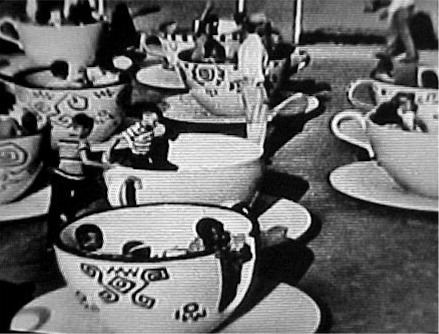 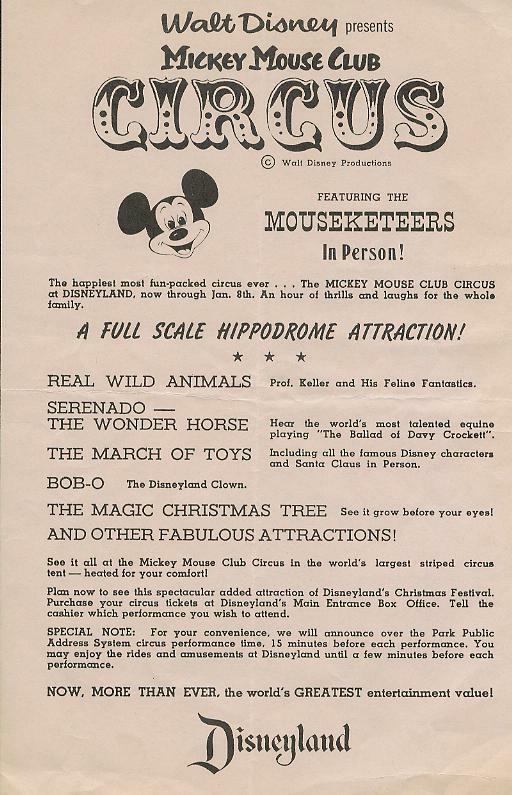 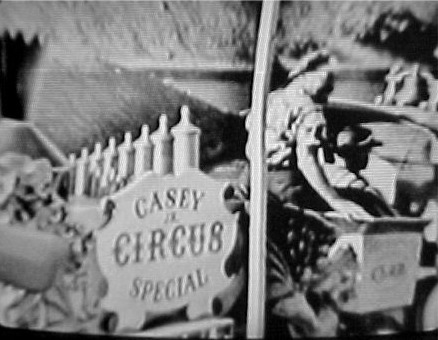 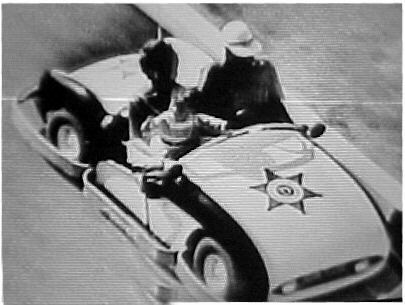 November--On Thanksgiving, the Mickey Mouse Club Circus debuts with a parade down Main Street USA but is poorly received and discontinued in early 1956. 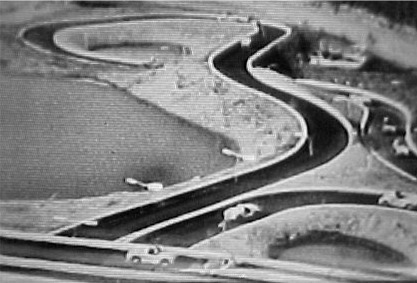 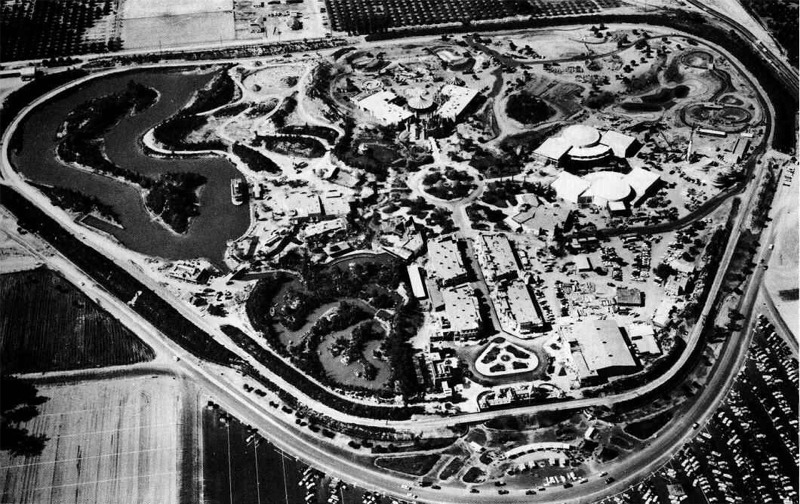 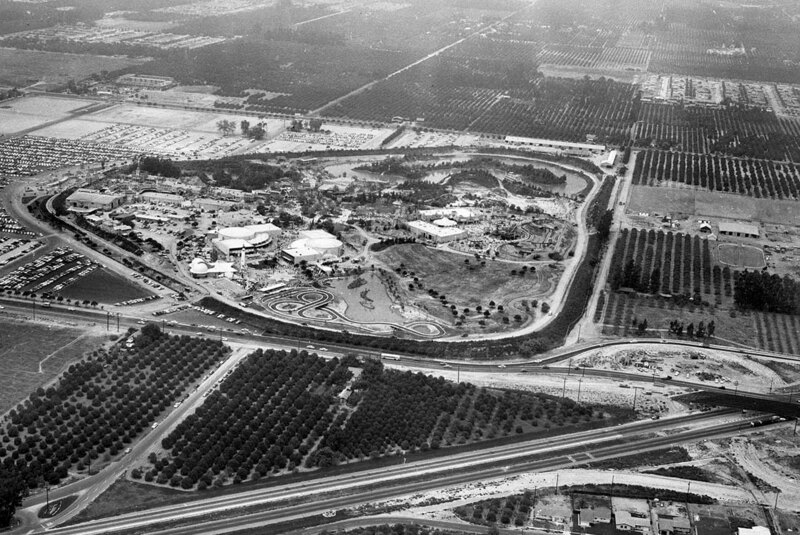 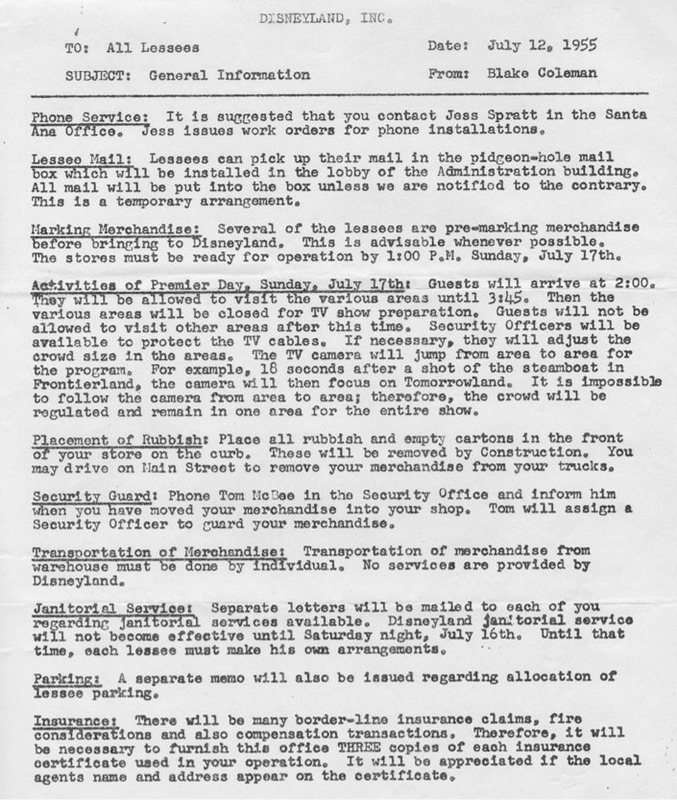 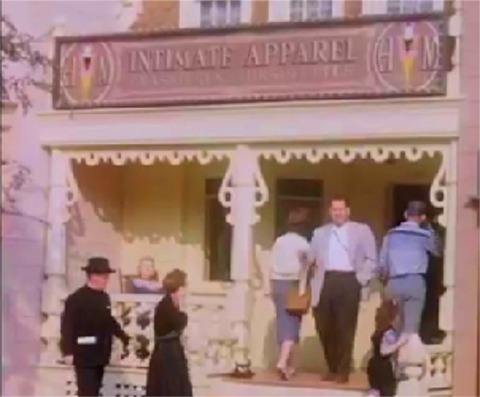 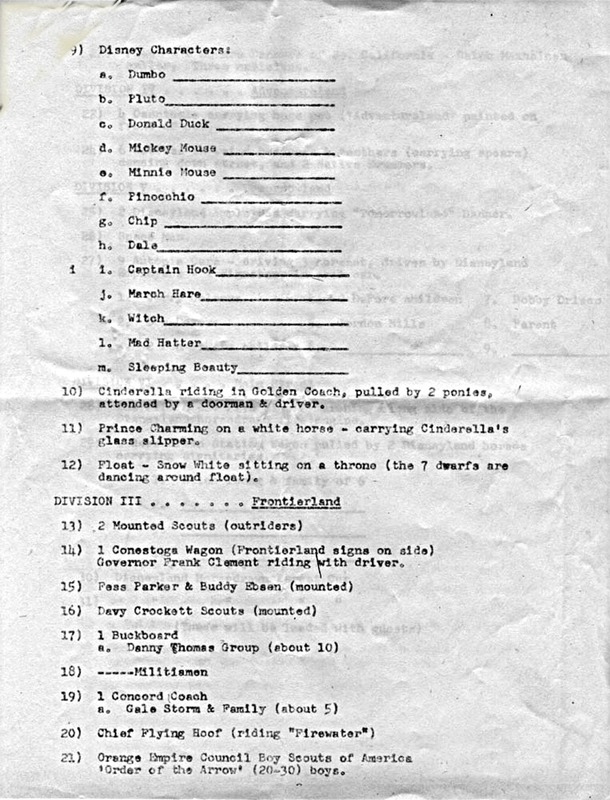 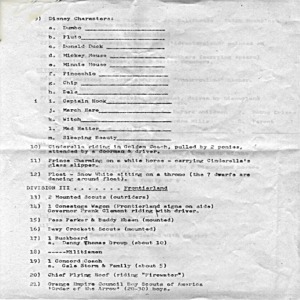 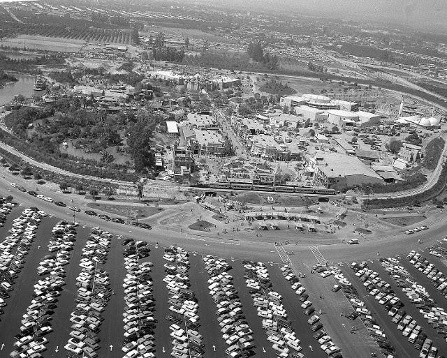 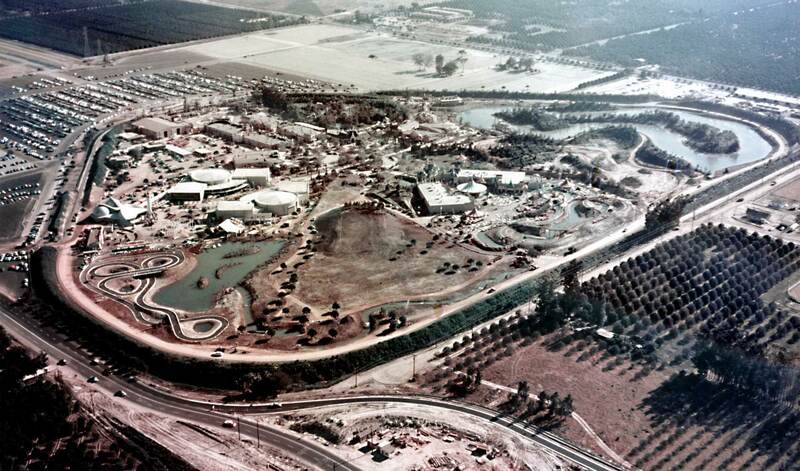 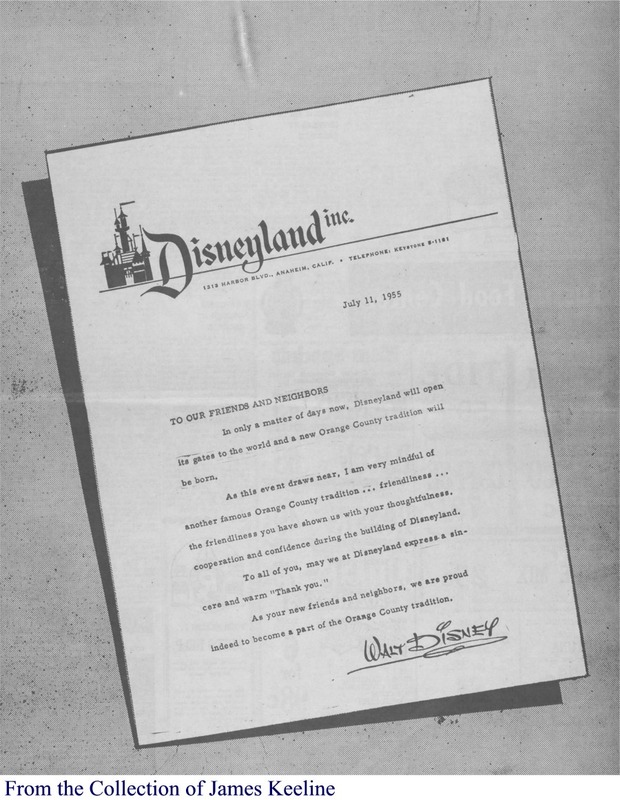 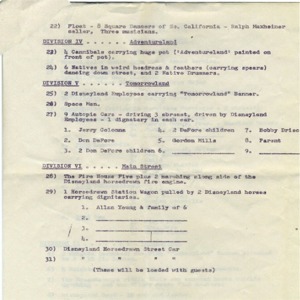 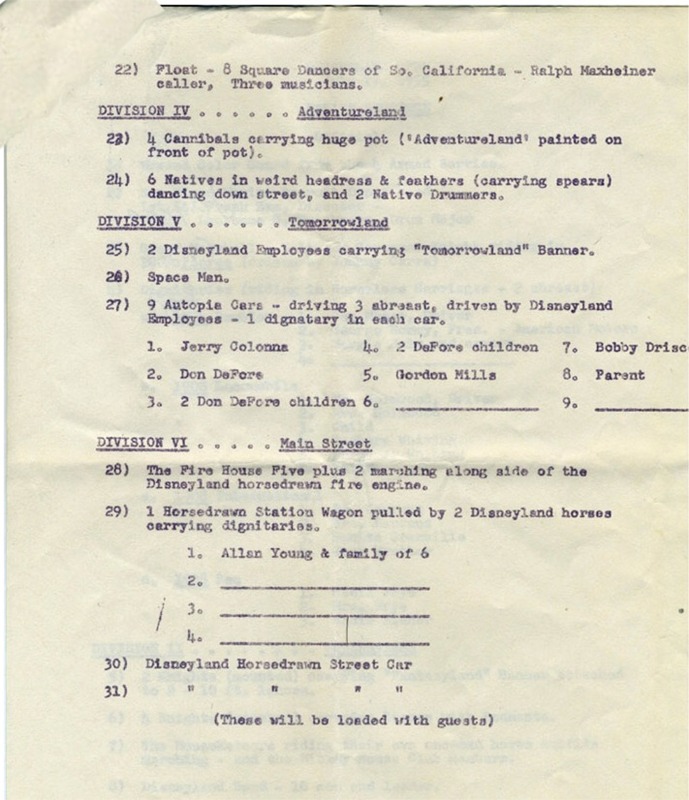 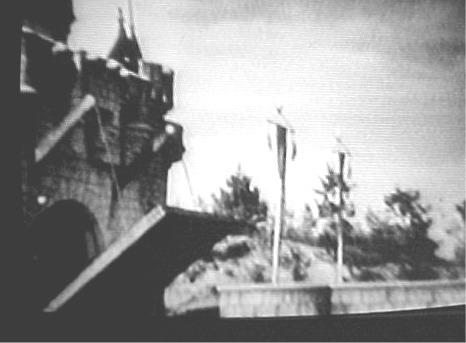 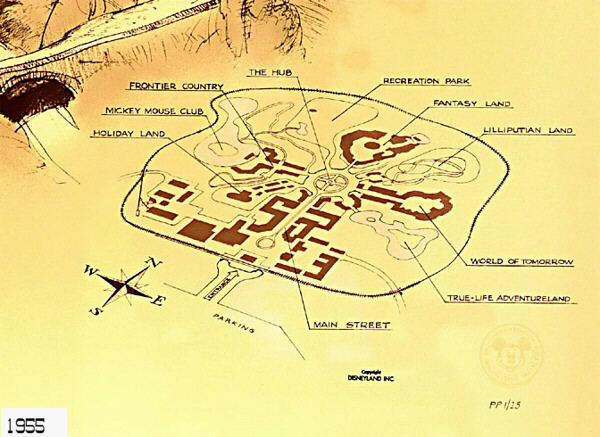 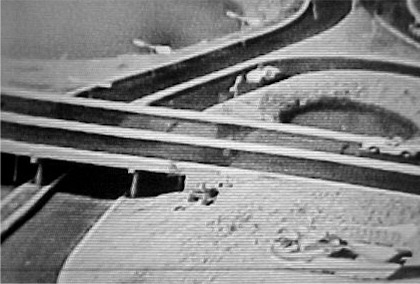 January 15--Despite plans to open the park without it, Walt decides to go ahead and build Tomorrowland saying that the park can only open as a complete experience. 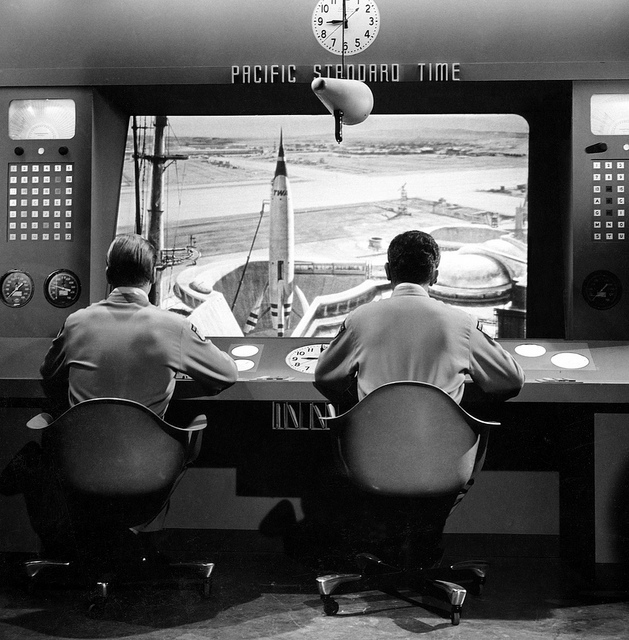 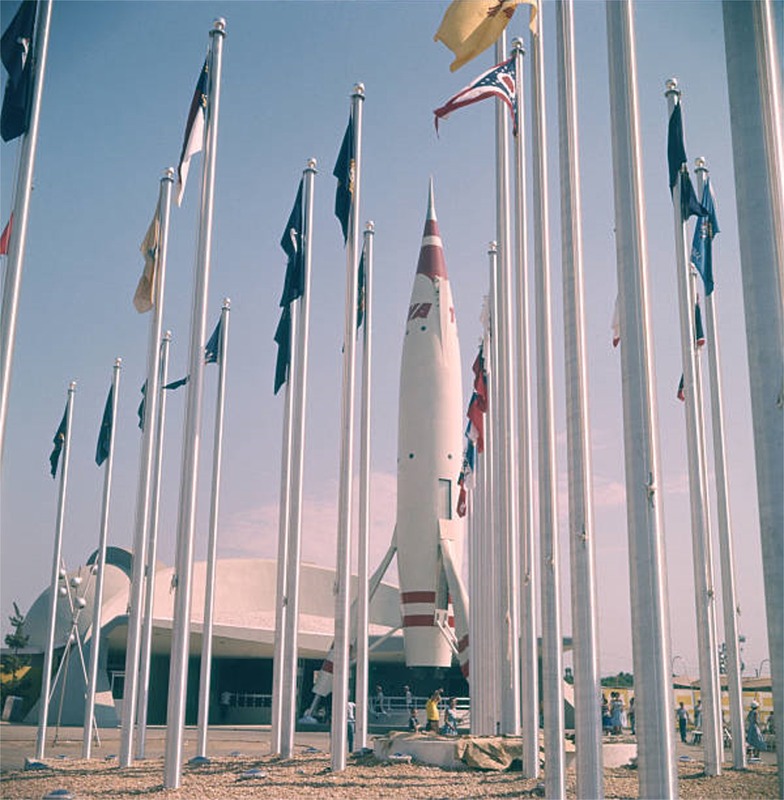 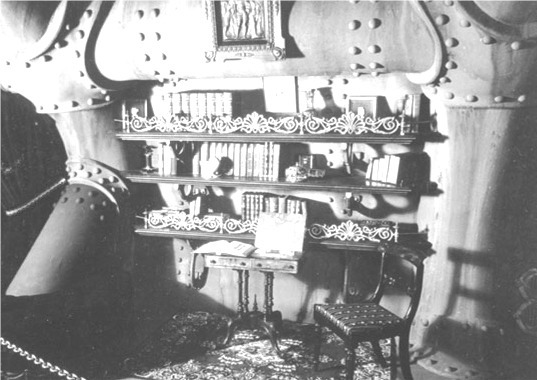 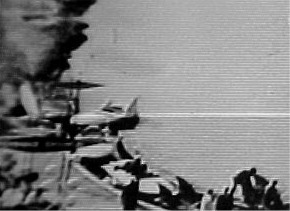 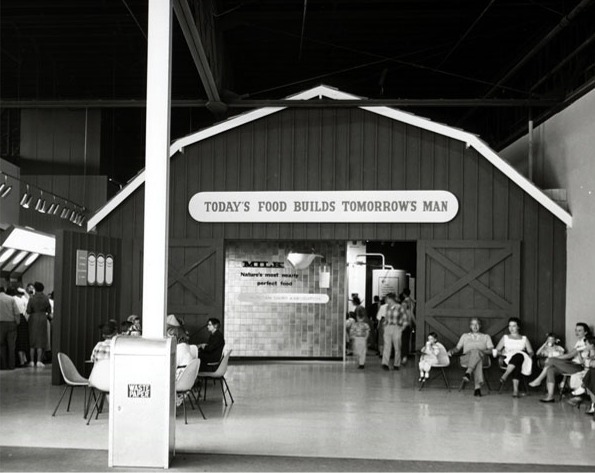 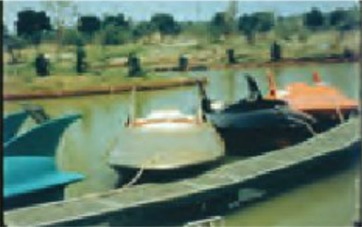 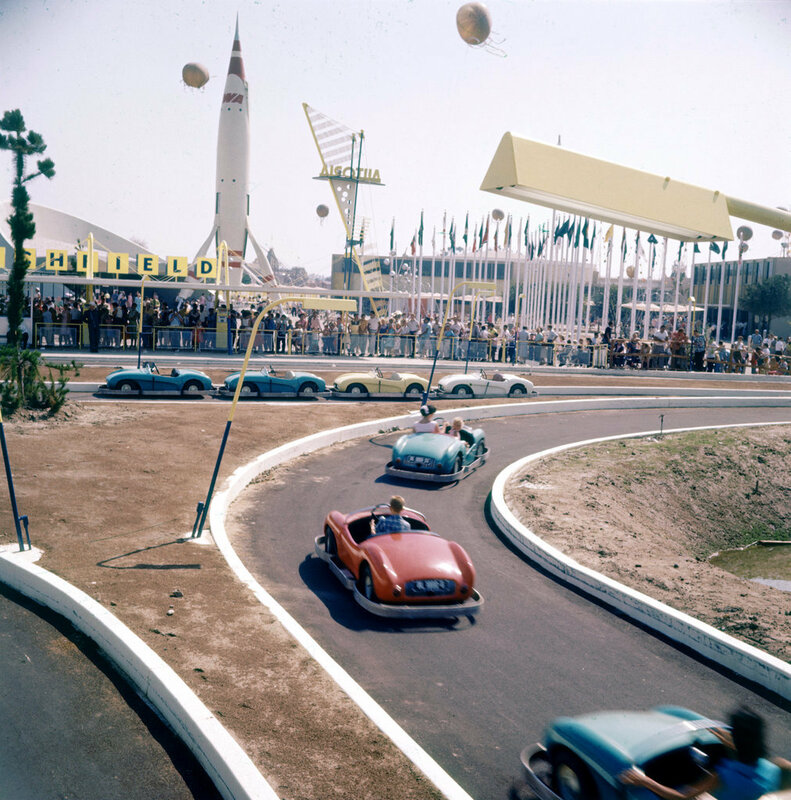 Admiral Fowler advised that the outlook for Tomorrowland was very grave, and despite the warnings, Tomorrowland was completed in six months and opened with the Autopia, Space Station X-1, and the Monsanto Hall of Chemistry. 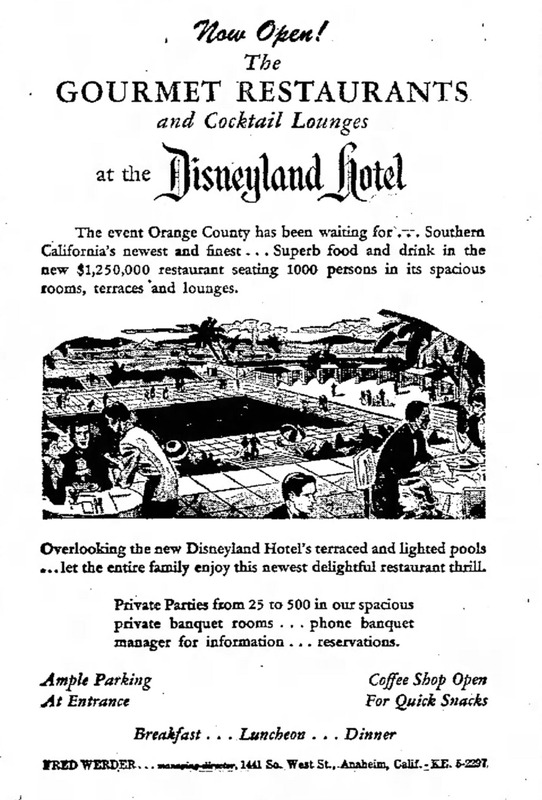 October--Disneyland Hotel opens on 60 acre site next to the Park. 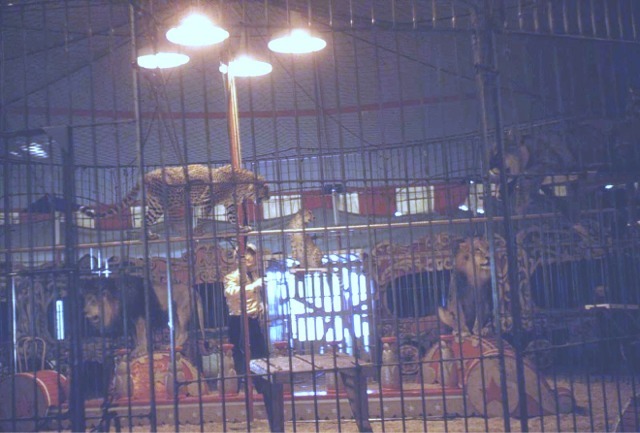 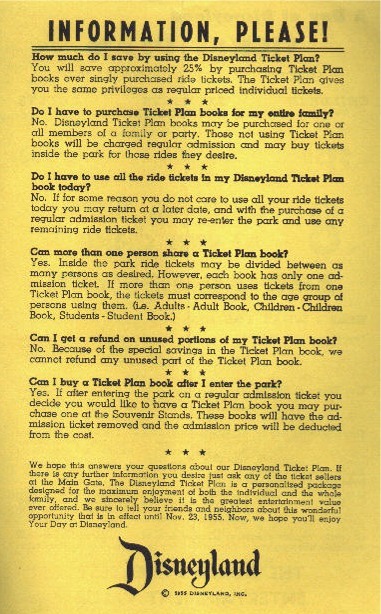 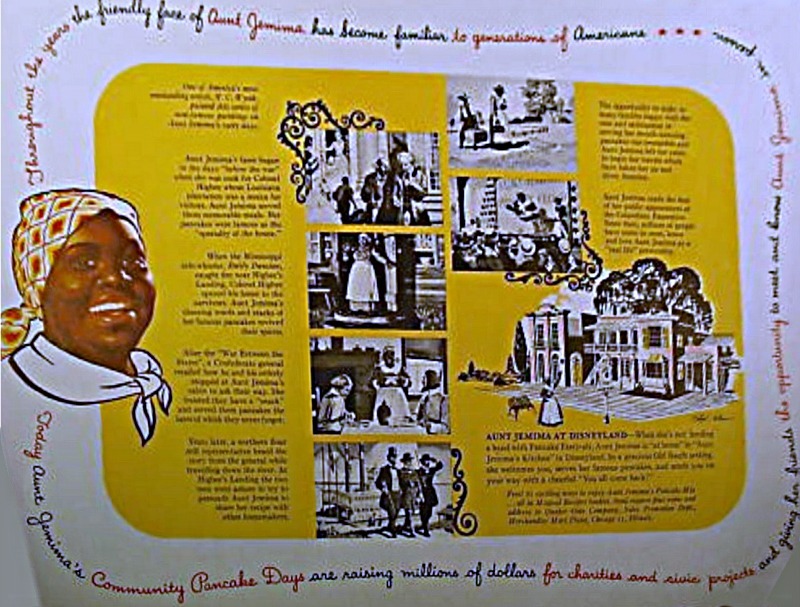 Ticket books available for the first time, containing A, B, and C Tickets. 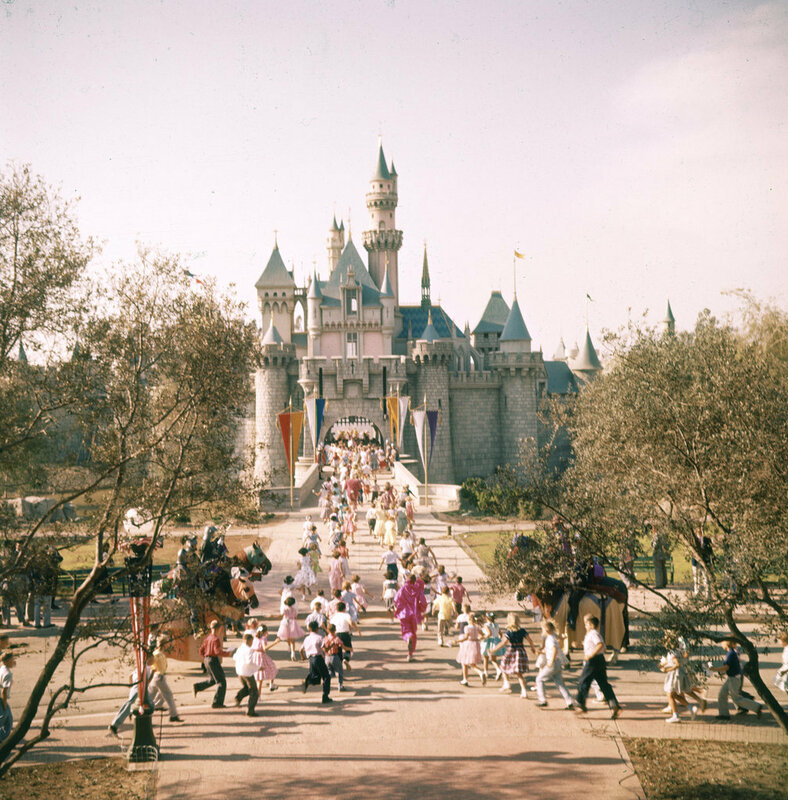 Disneyland, a $17,000,000 fairyland dedicated to the pleasure of children, opened Sunday in a special preview of 35,000 invited guests whose enthusiasm indicated that Walt Disney's dream had lived up to expectations. The spectacular park will be opened officially to the public at 10 a. m.
Disneyland--a steel-and-concrete Never-Never Land for youngsters--has come to life at Anaheim, Calif. 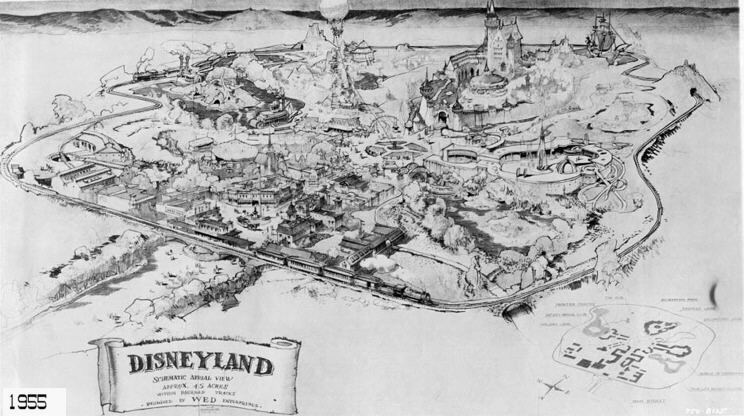 It's Walt Disney's fantastic kingdom dropped out of a cloud onto 160 acres. 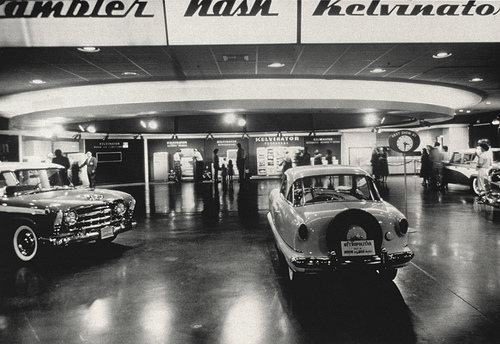 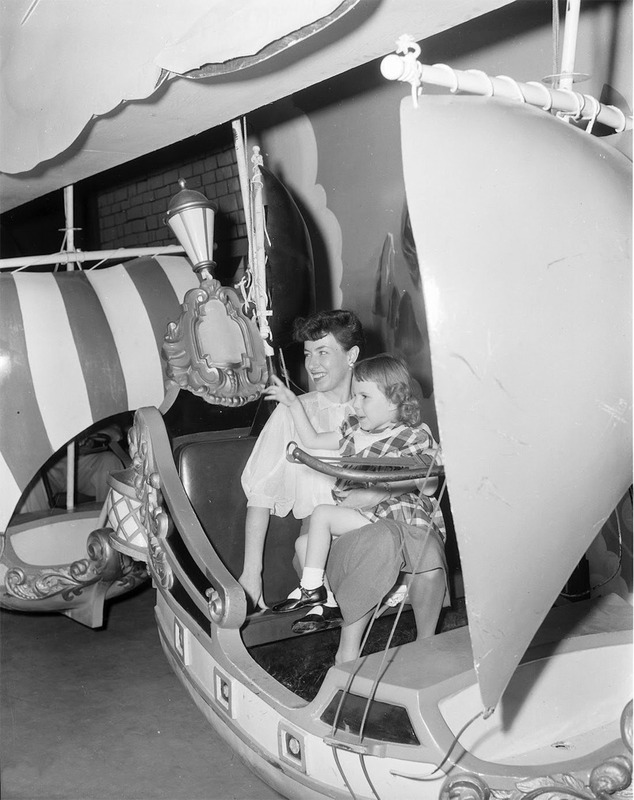 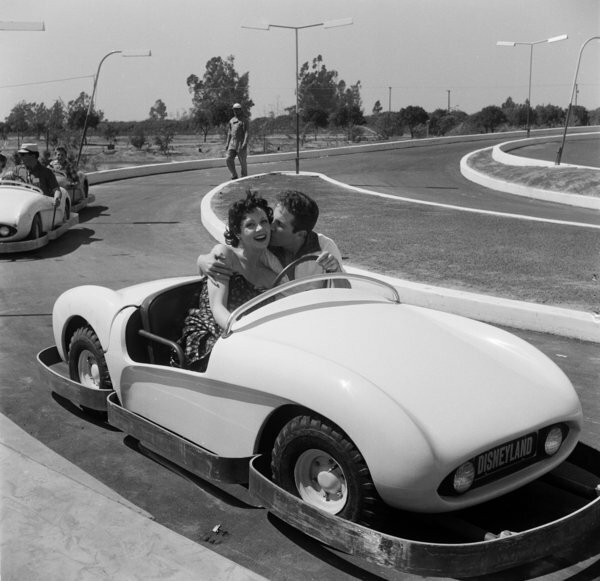 There your child can drive the car of the future, ride in a Mississippi stern-wheeler or romp through a medieval castle. 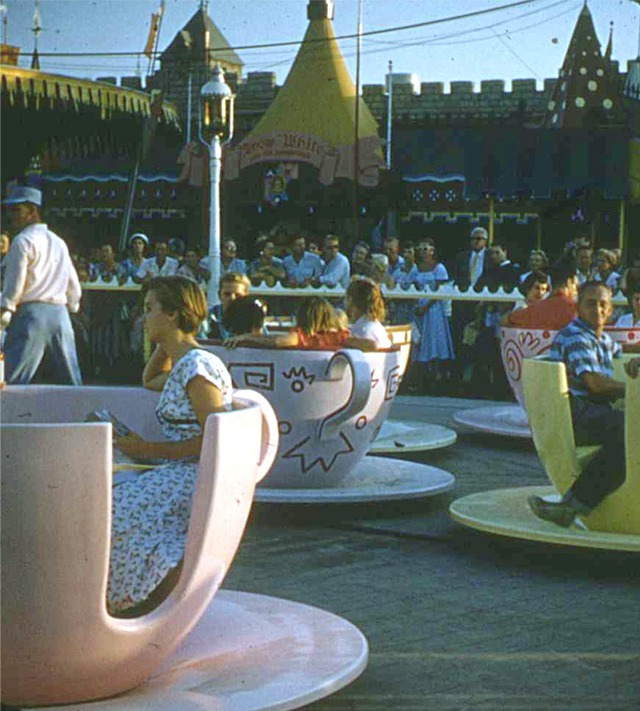 It may be more than the kids can bear. 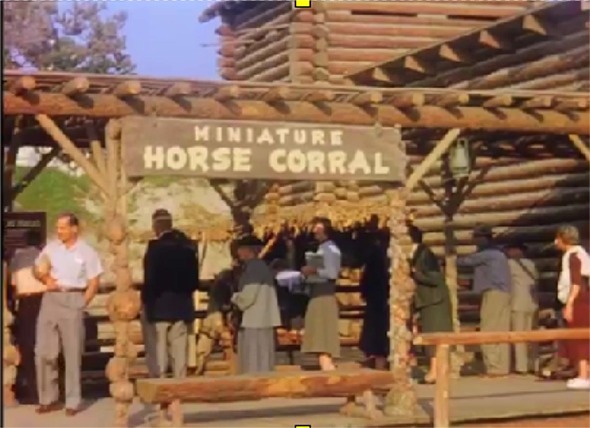 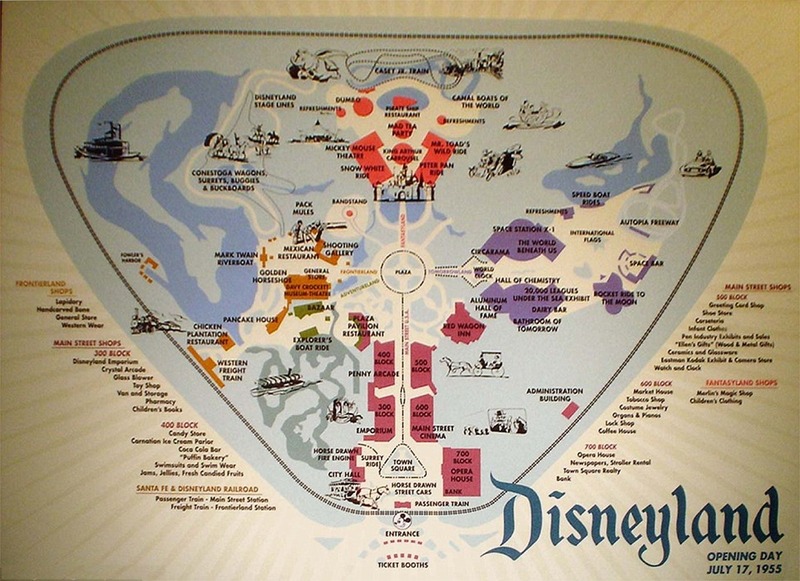 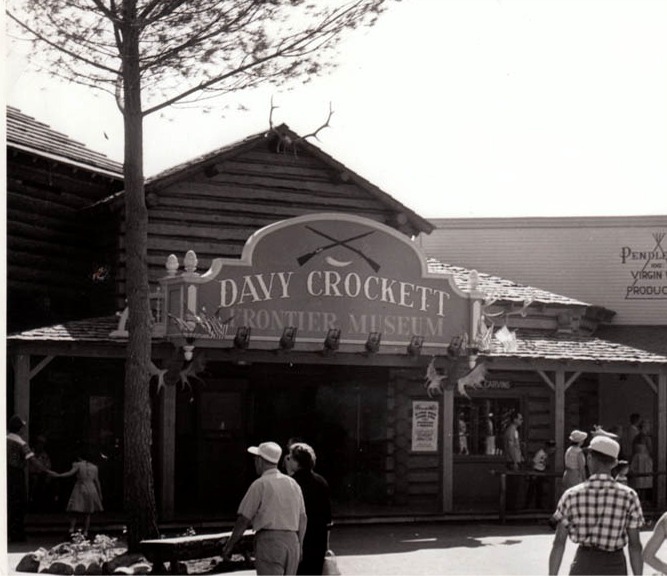 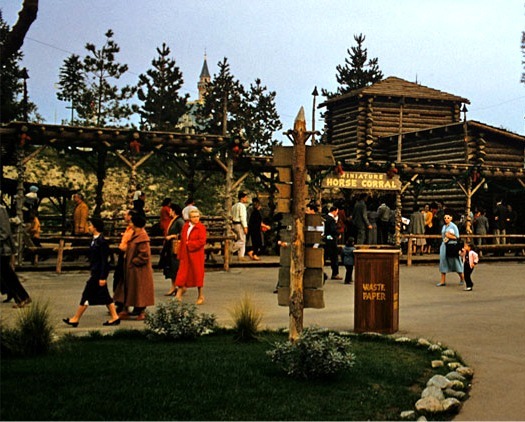 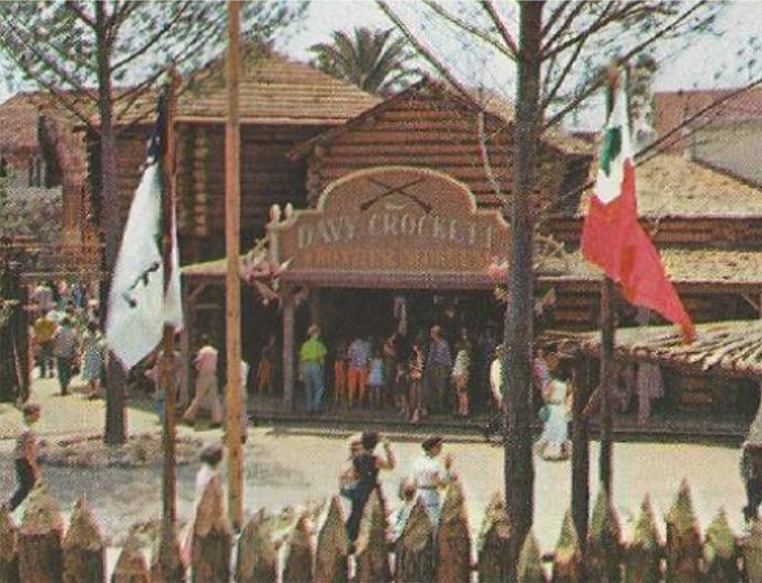 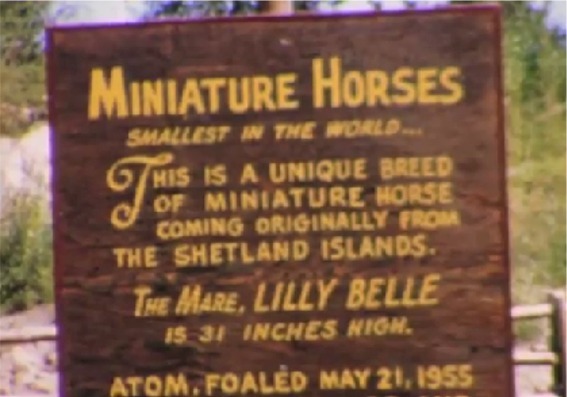 It has an Adventureland from Tahiti, a Frontierland entered through the log gates of an old fort complete with a Davy Crockett museum, a Fantasyland full Snow White, Peter Pan, Sleeping Beauty and all their associates, and a Tomorrowland with a Space Port.